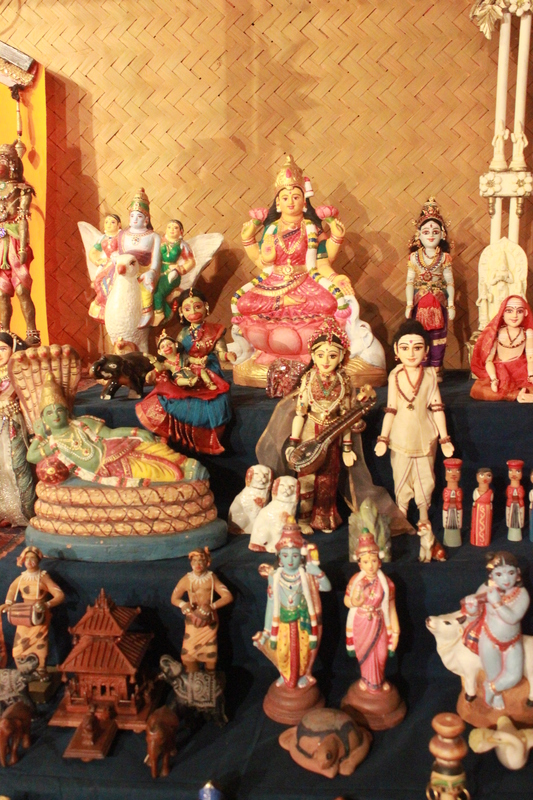 A lot of colour, exquisite Dasara dolls, traditional splendour, doll arrangement interspersed with theatre and between all that taking in the rich aroma of flowers, food and festivities were some of the highlights of the Dasara Golu Walk arranged by Unhurried.in. 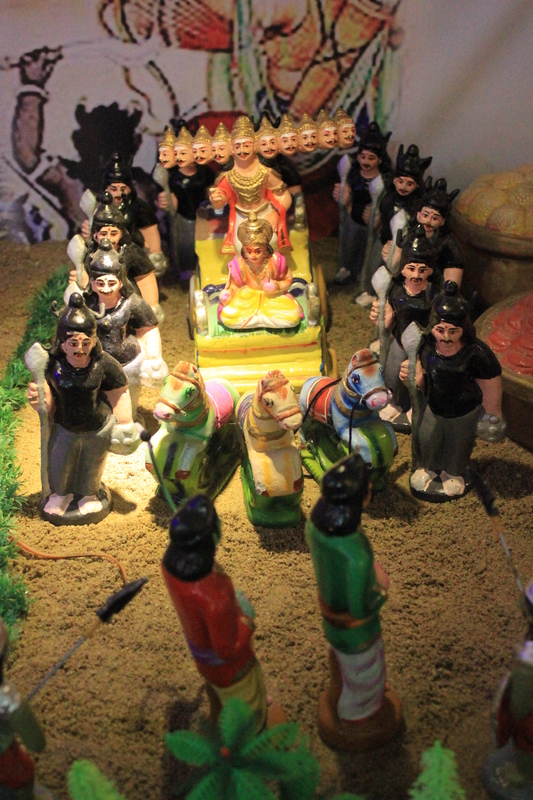 The walks had been arranged over the Dasara week from 29 September to 4 October. I chose to attend the walk on 2 October. 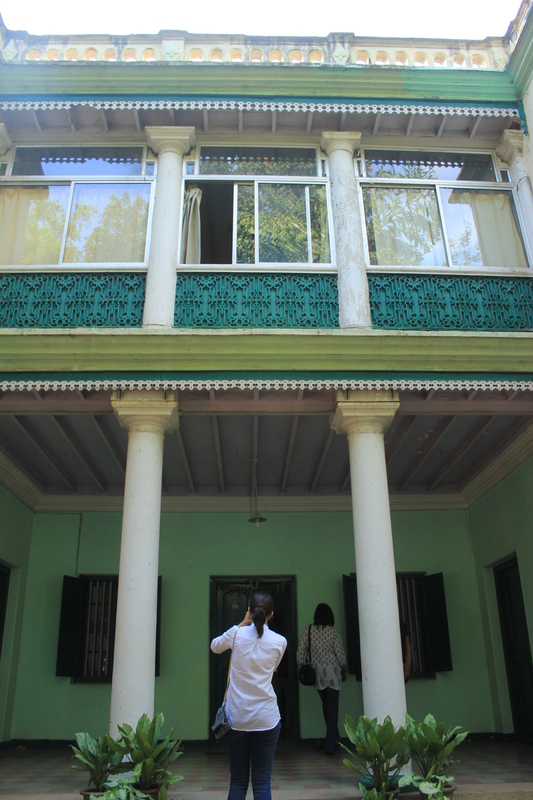 We were first shown into the 107-year-old house of Diwan Sir MN Krishna Rao, erstwhile Diwan of Mysore kingdom. 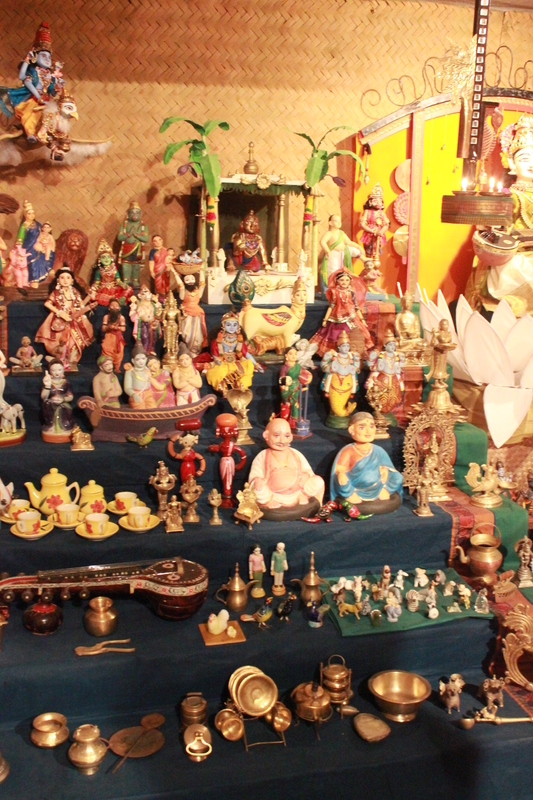 The dolls, most of them miniature, were arranged meticulously by Mrs Narendra, wife of the Diwan’s great grandson. 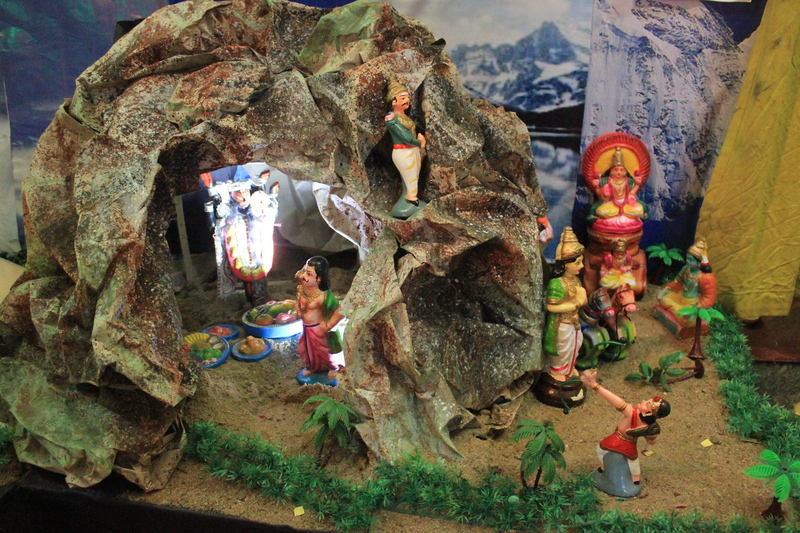 The main display was at the centre and consisted of 4 steps with the 3 Raja-Rani dolls hogging the limelight. 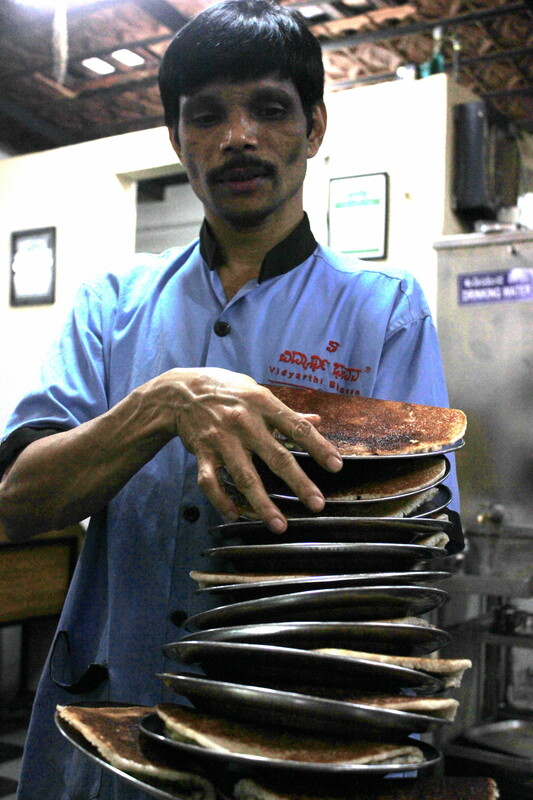 A masala dosa at Vidyarthi Bhavan later we were off to the next house but not before savouring the colours and aromas of different varieties of flowers at Gandhi Bazaar. 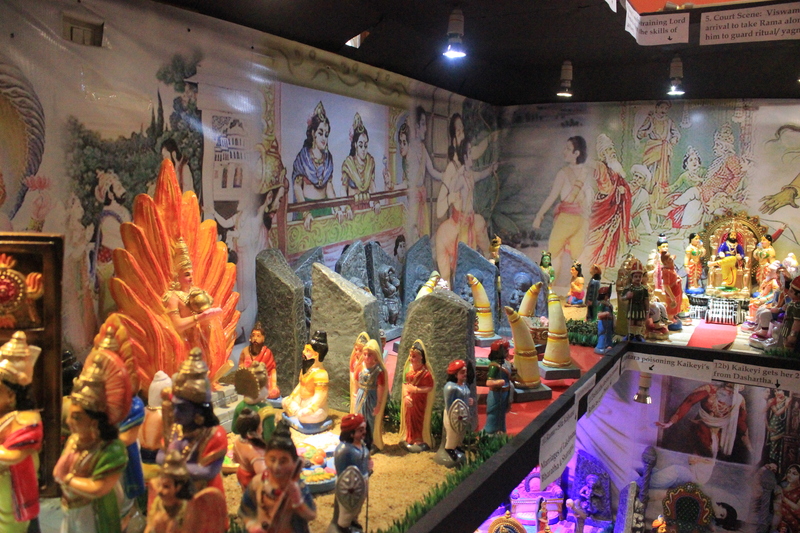 I have never seen a market looking more colourful! 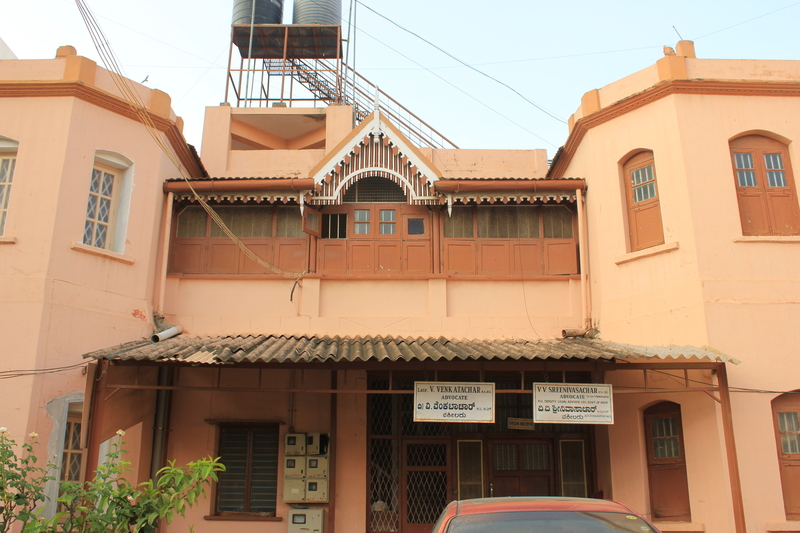 As we walked to the next house, we passed by a house said to be the childhood home of former Tamil Nadu CM Jayalalitha. 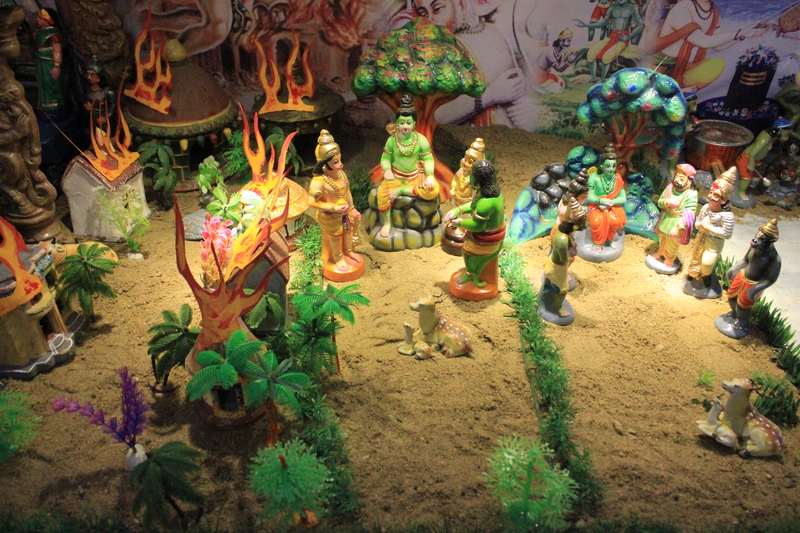 Lord Brahma and Bhoomi Devi seek Lord Vishnu’s help to slay demon king Ravana. 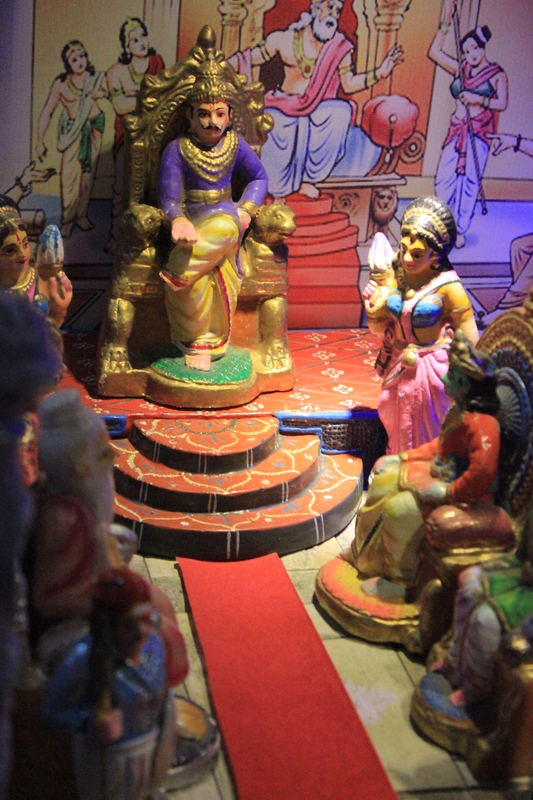 King Dasharatha performs Putrakameshti Yagna to beget a son. 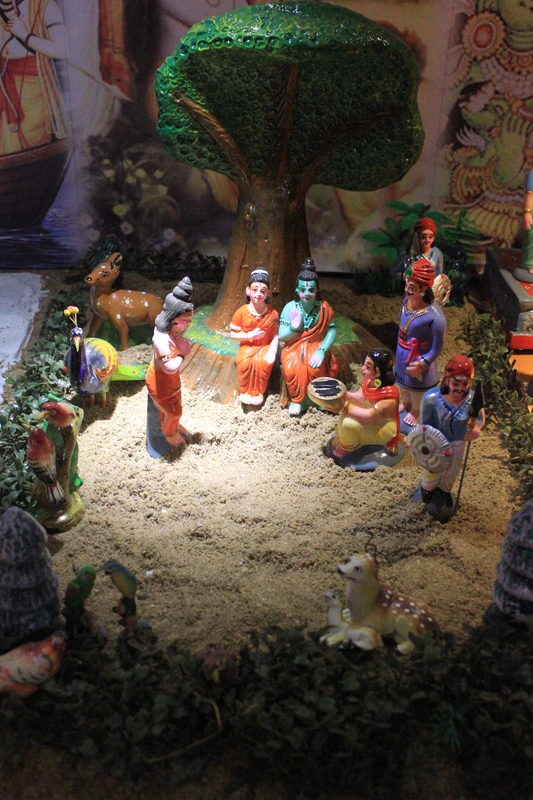 Birth of princes Rama, Lakshmana, Bharata and Shatrughna. 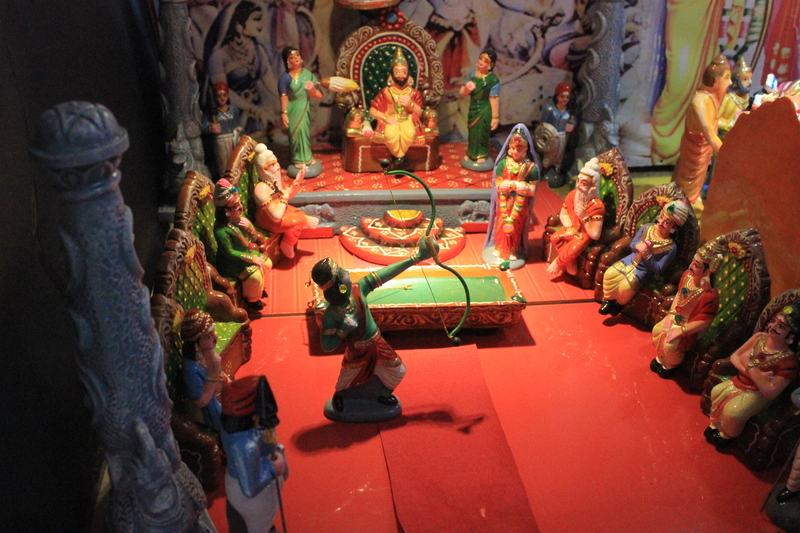 Sage Vashista trains the princes in archery. 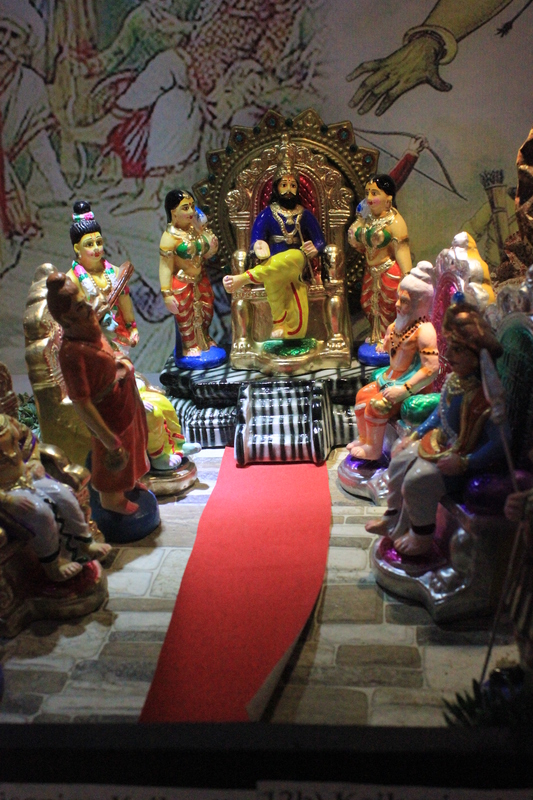 King Dasharatha expresses his desire to coronate Rama as crown prince. 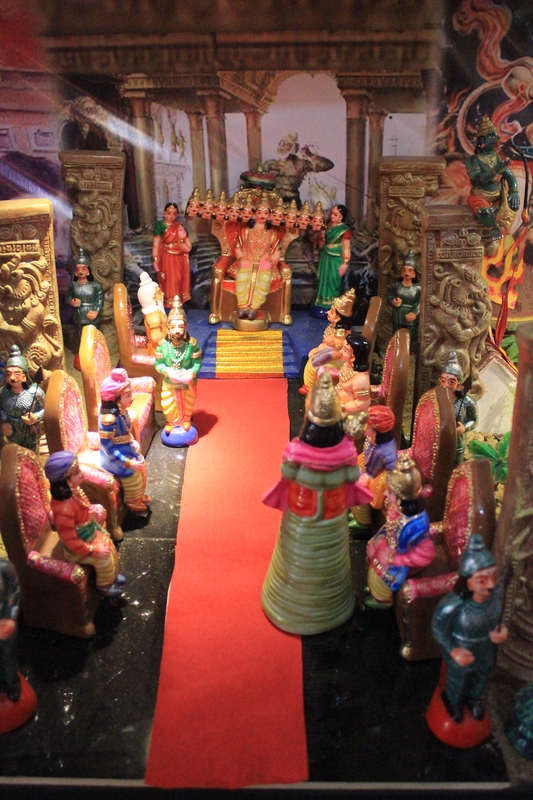 A court scene depicting the arrival of sage Vishwamitra to take Prince Rama along with him to guard his yagna. 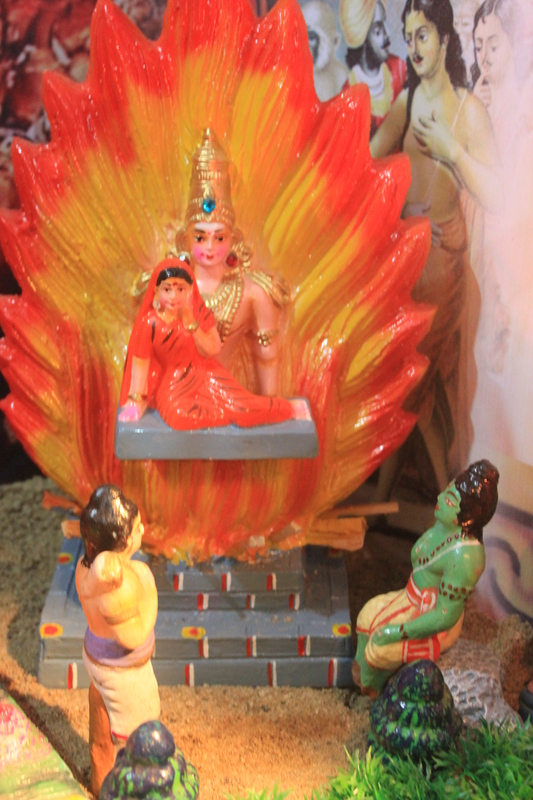 Rama slays demoness Tataka as he approaches the yagnasthala. 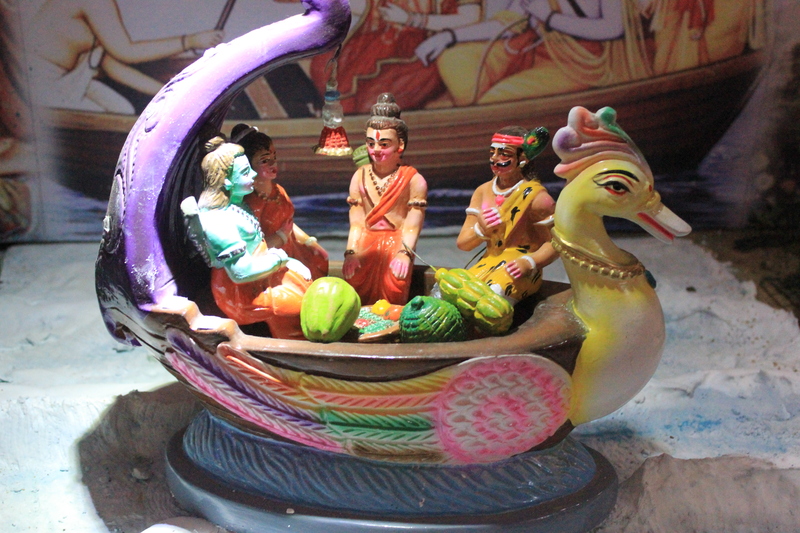 Rama breaks Shiva’s celestial bow. 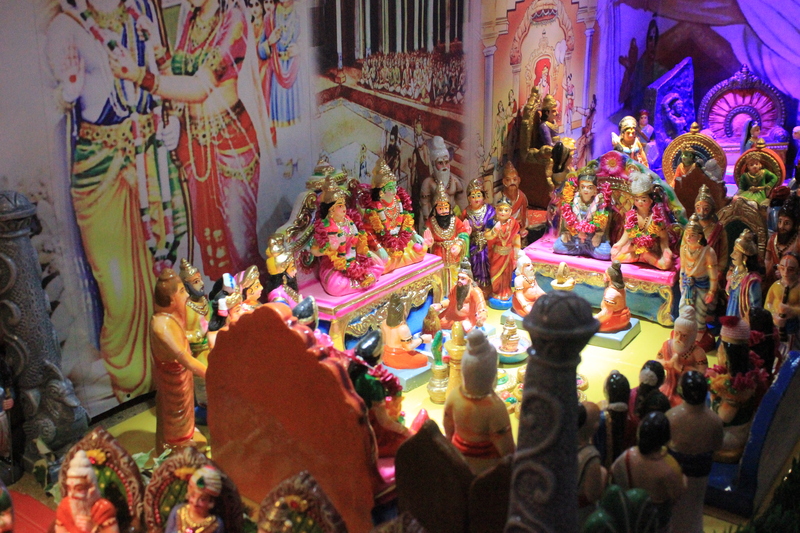 The weddings of Rama and Sita, Lakshman and Urmila and also those of Bharata and Mandavi and Shatrughna and Shrutakeerthi. 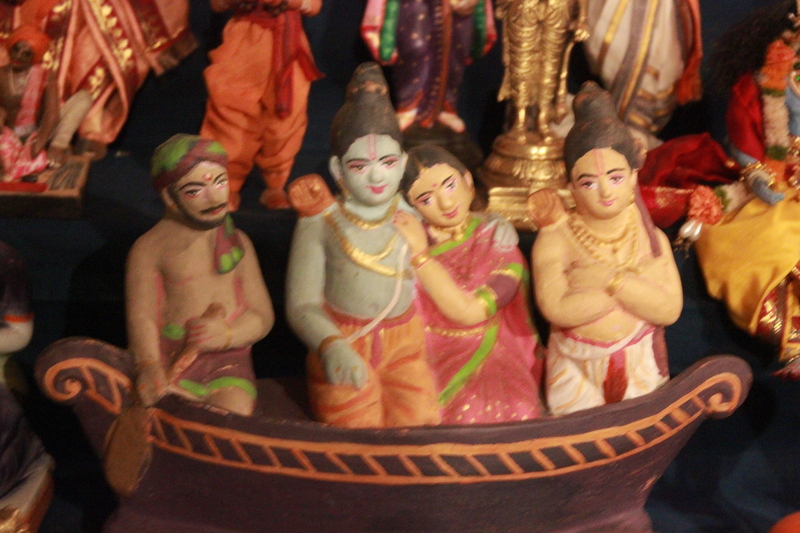 Guha offers Rama, Sita and Lakshmana help in crossing three rivers during their vanavaasa. 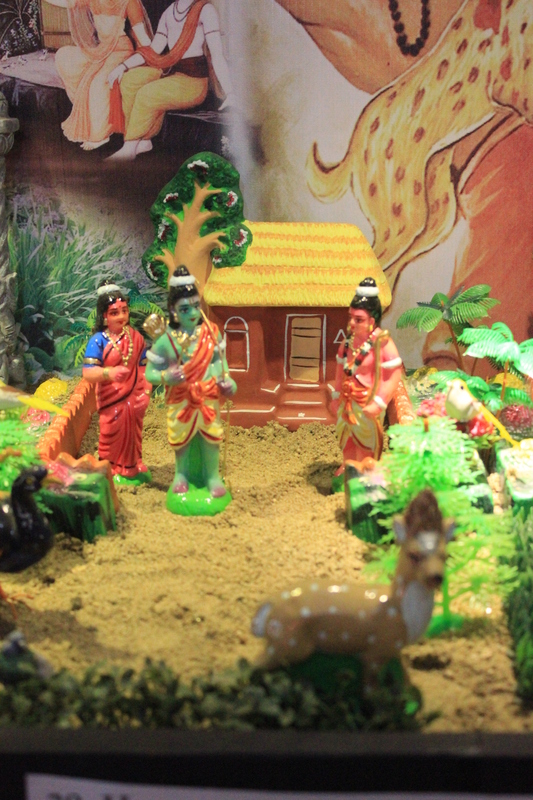 Bharata breaks the sad news of Dasharatha’s death to Rama at Chitrakoota. 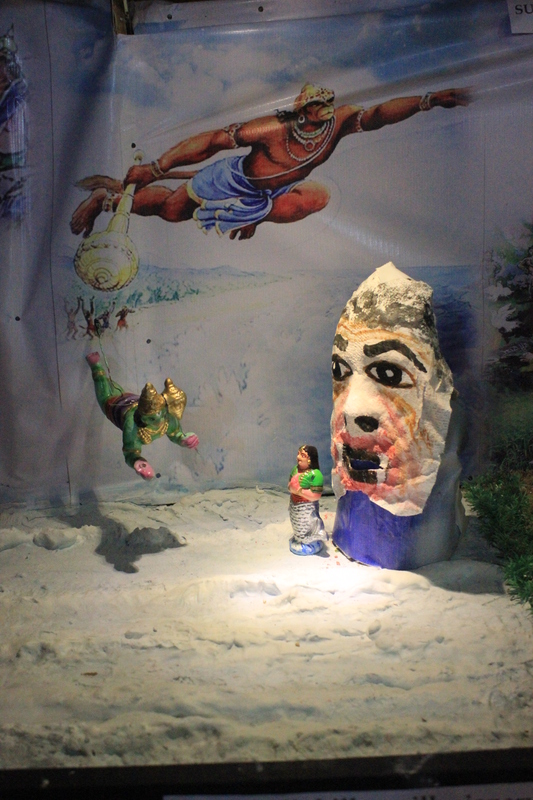 Lakshmana chops off demoness Shurpanakha’s nose. 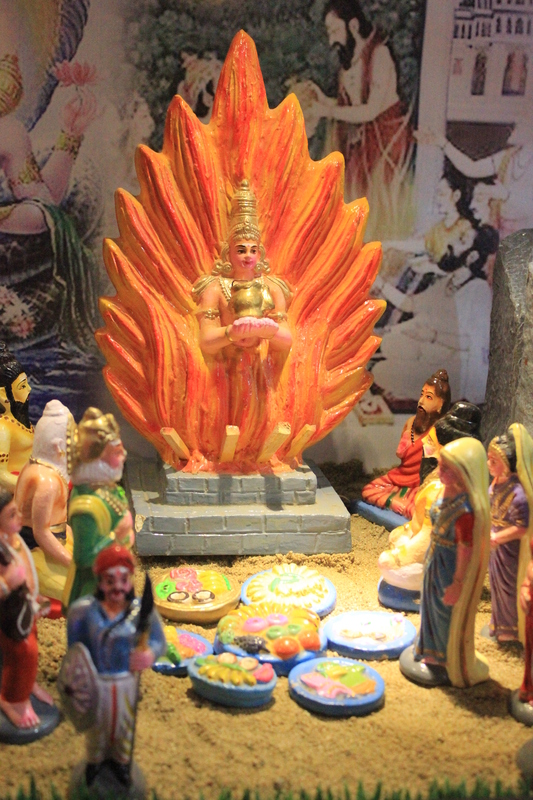 The demoness in her human-like avatar had tried to woo Lakshmana who spurned her advances. 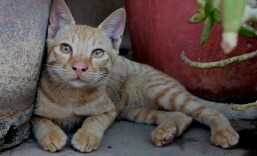 She in turn had tried to attack him. 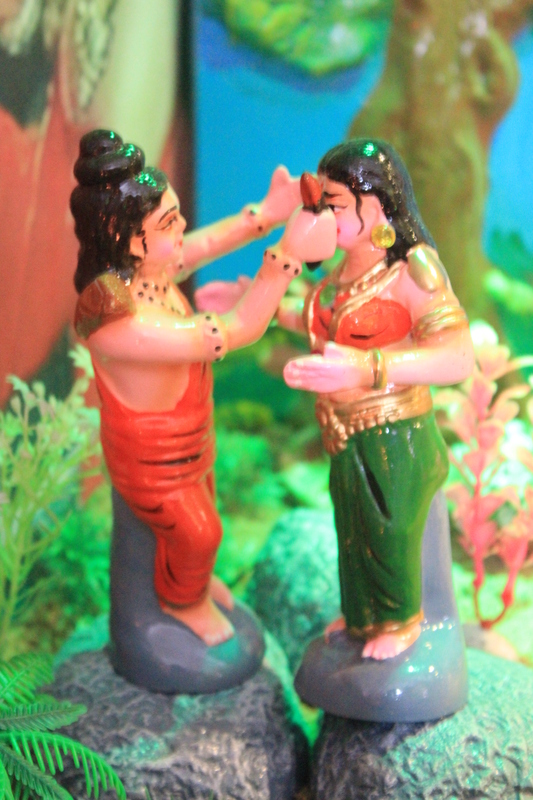 Lakshmana (partially hidden) chops off Shurpanakha’s nose. 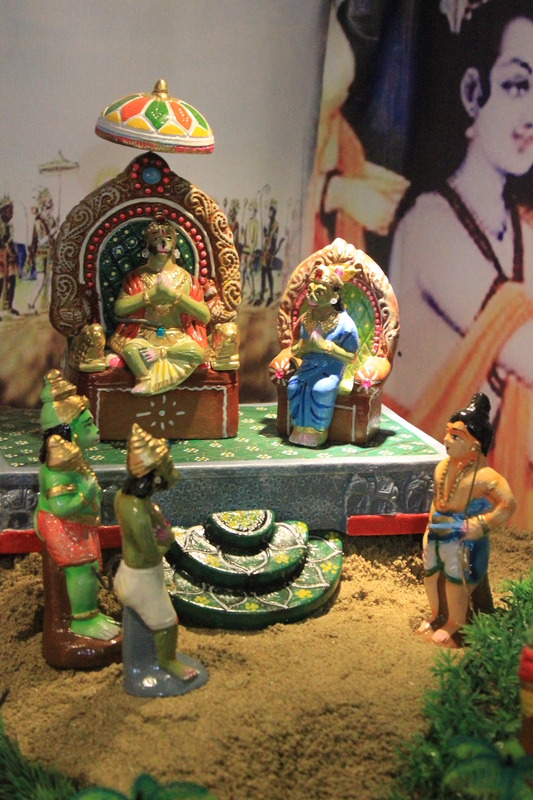 Shurpanakha complains to her brother Ravana. 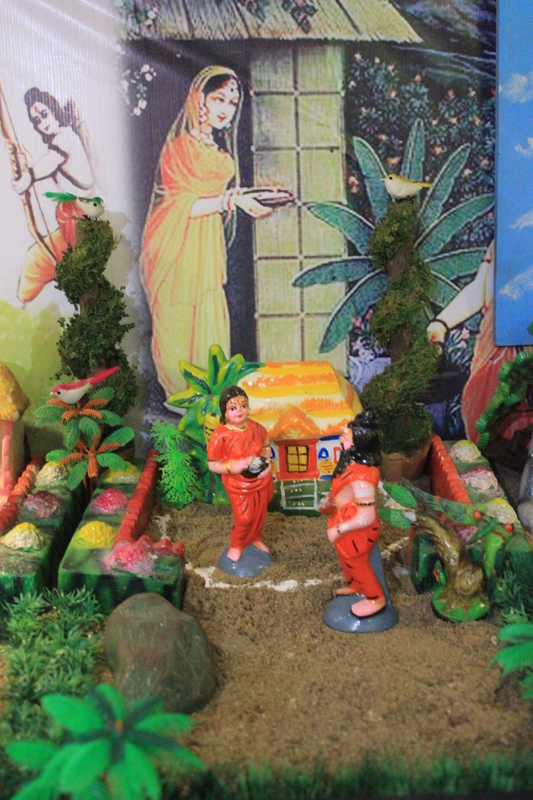 Sita is allured by the golden deer. 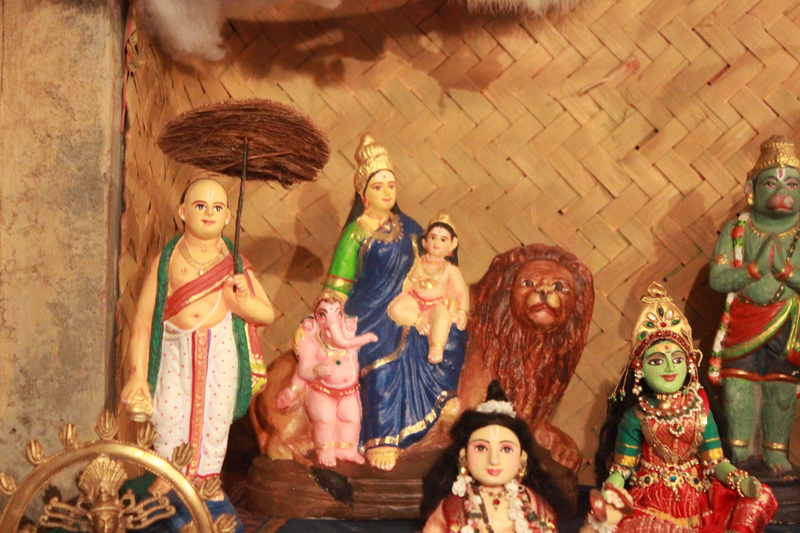 Rama kills Mareecha (disguised as a golden deer). 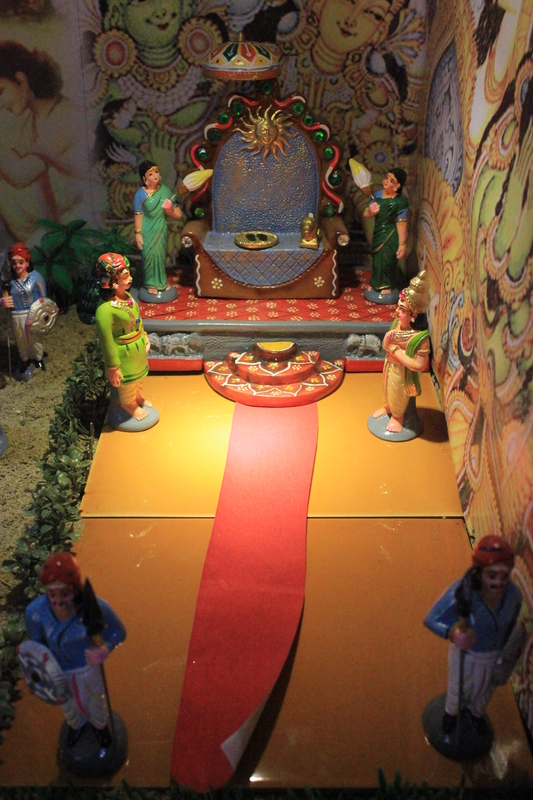 Mareecha mimics Rama and calls out to Sita and Lakshmana. 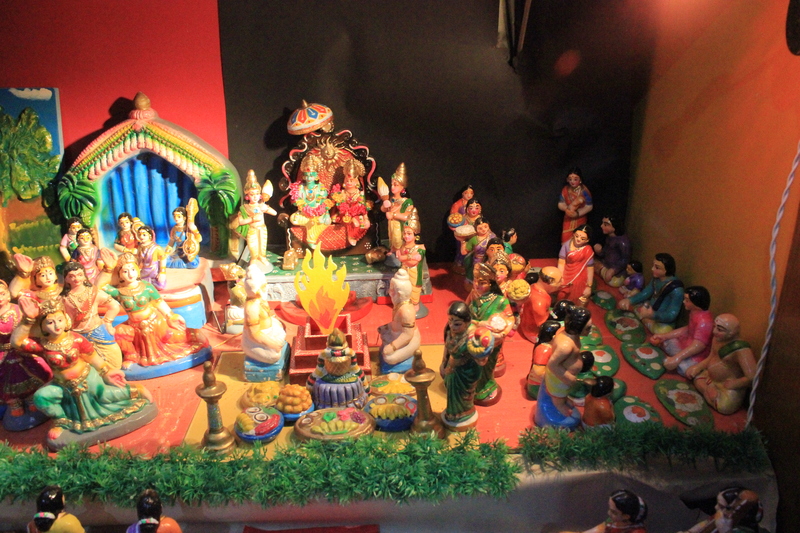 Sita urges Lakshmana to go. 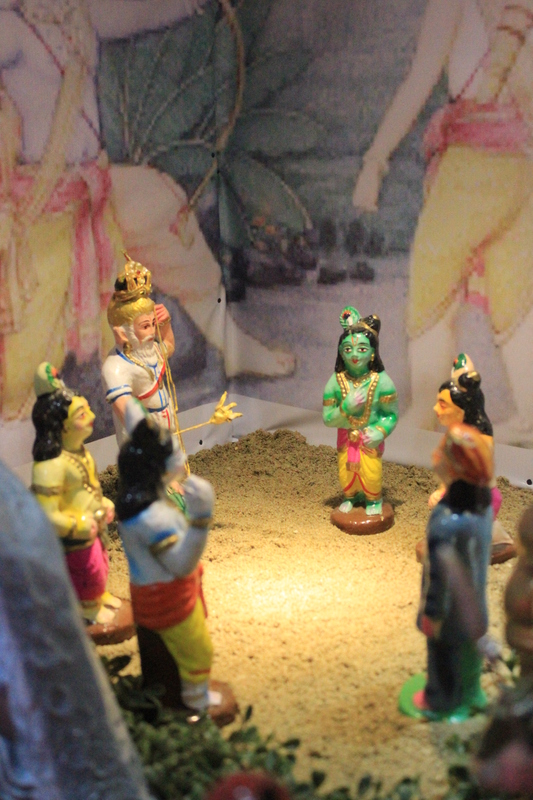 Lakshmana draws a line (popularly called the Lakshman Rekha) and instructs Sita not to cross the line. 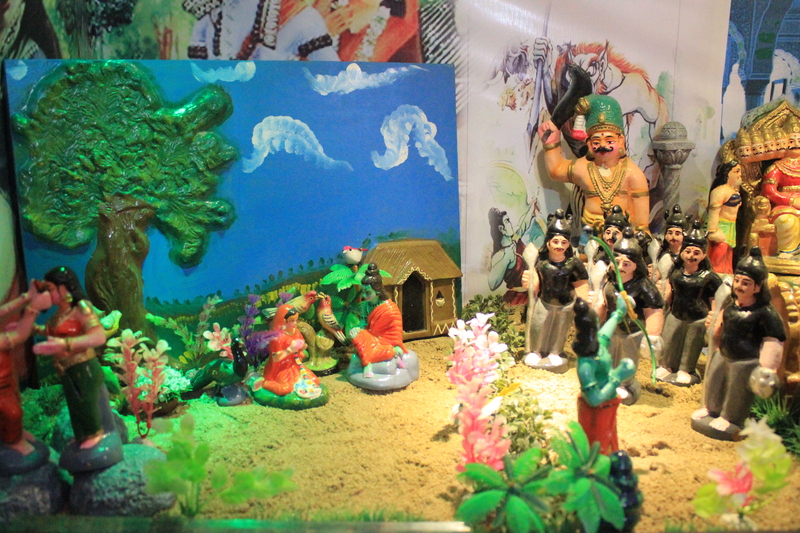 Ravana arrives in the guise of a sage to fool Sita and kidnap her. 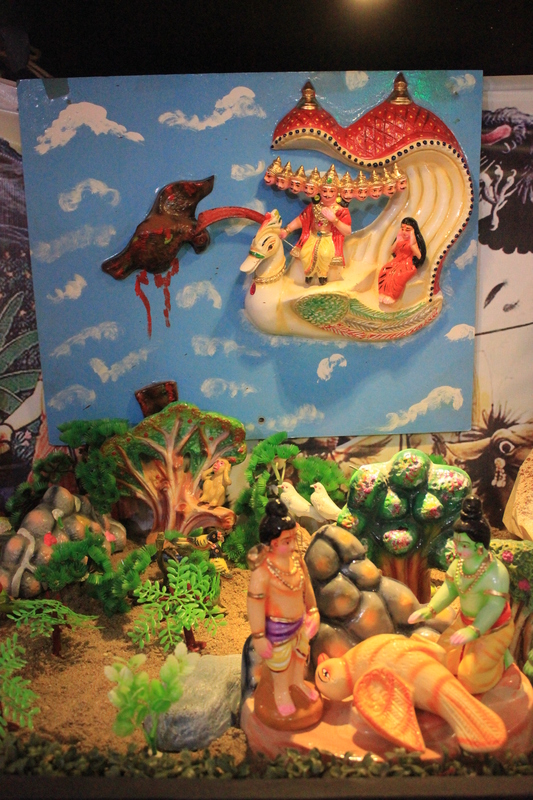 Jatayu, the brave vulture tries to save Sita from Ravana’s clutches. 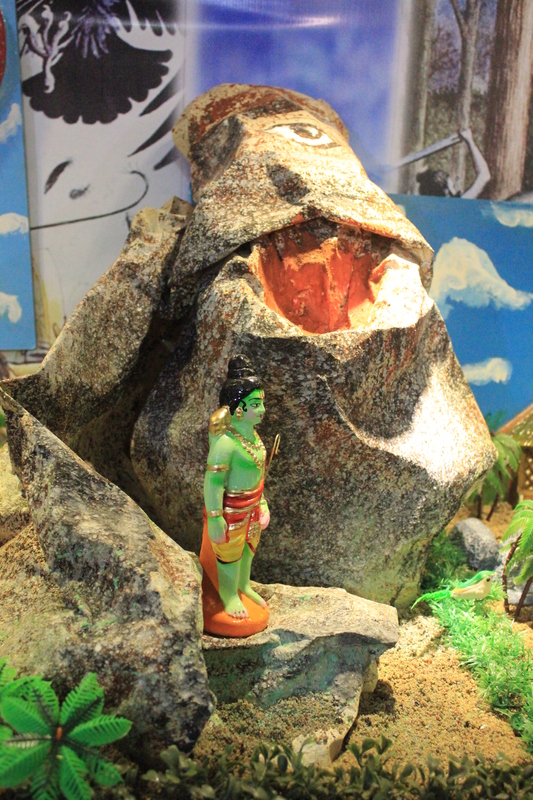 A badly injured Jatayu informs Rama about the kidnapping and also shows him the direction in which Ravana took Sita. 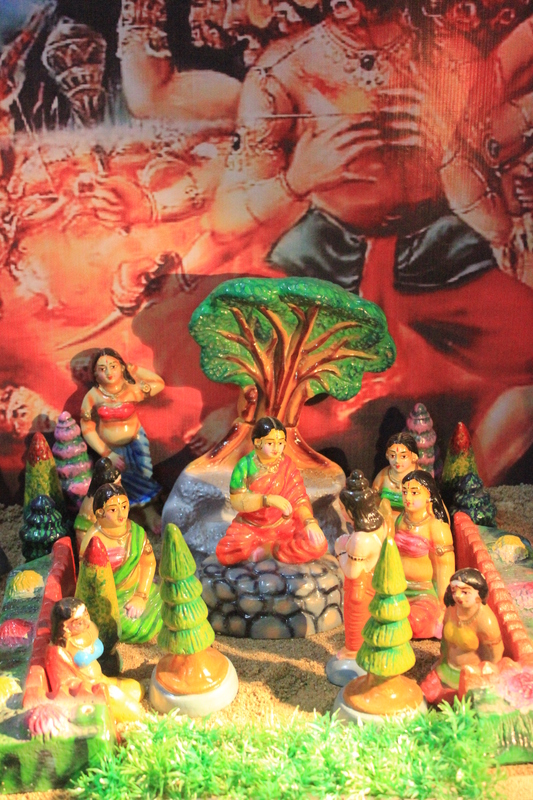 The rakshasa Khabanda advices Rama to meet Sugriva. 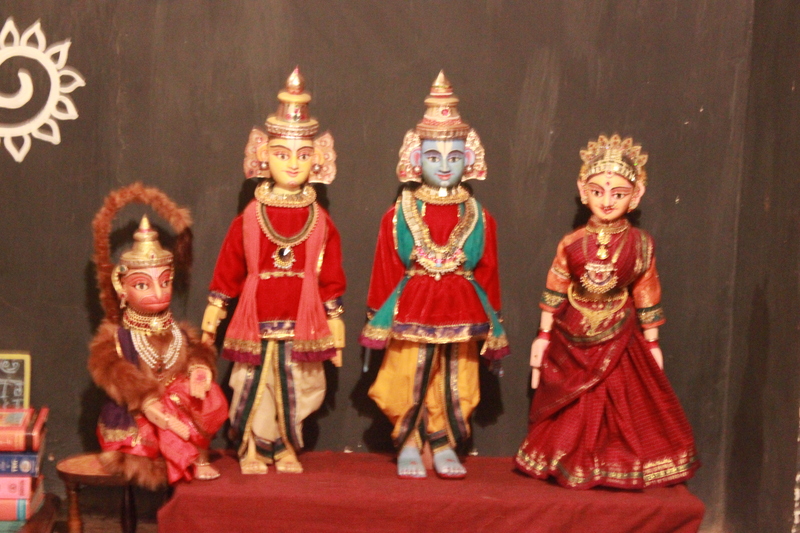 Rama meets Hanuman and Sugriva. 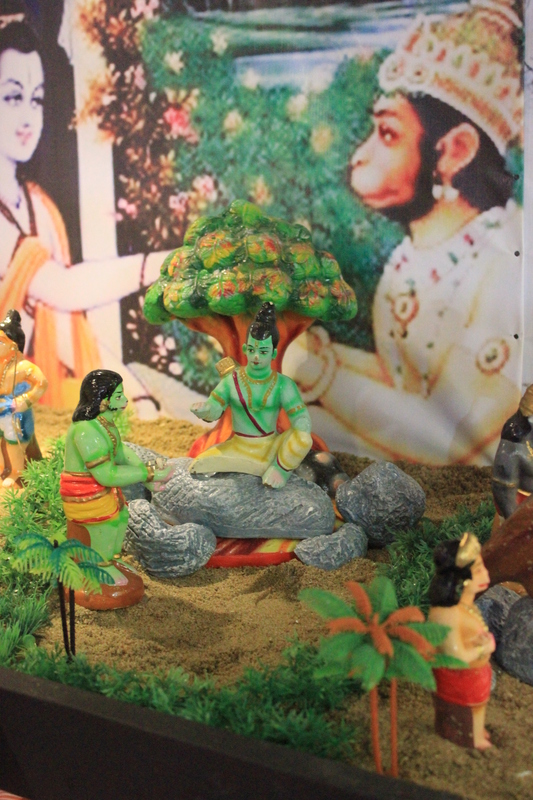 Rama gives his ring to Hanuman as a token of love before Hanuman leaves for Lanka. 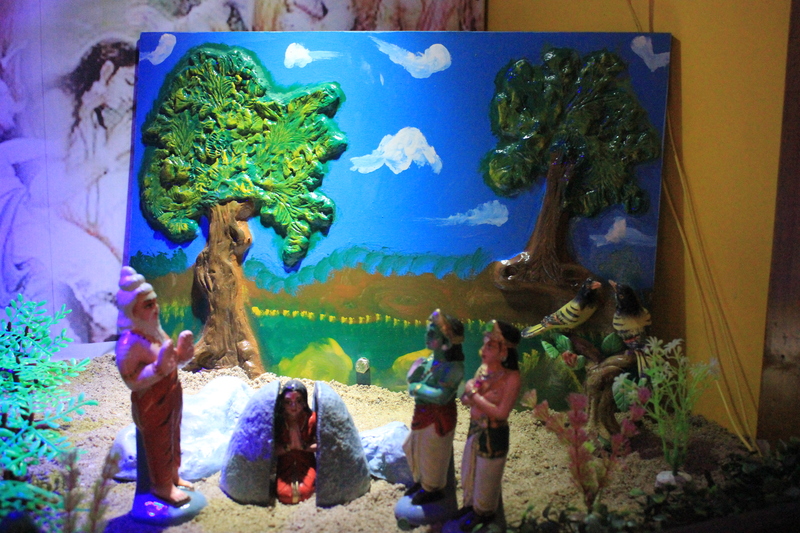 Jatayu’s cousin Sampaati informs Angad, Sugriva’s nephew, about Sita. 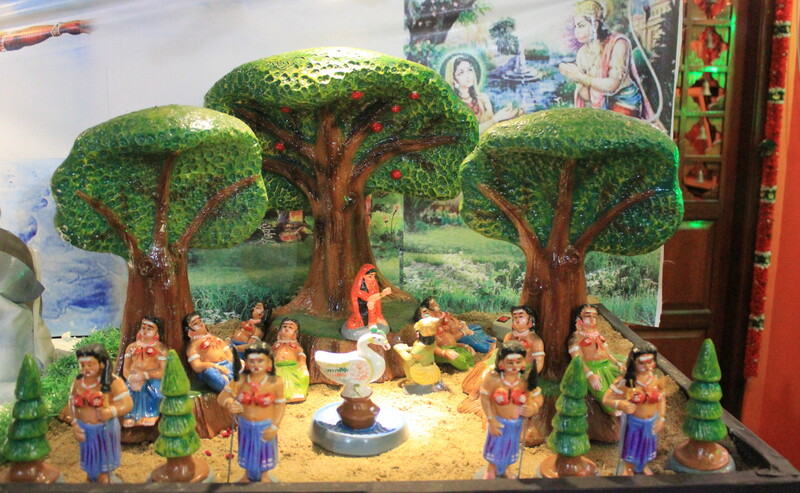 Sampaati then gets new wings and flies away. 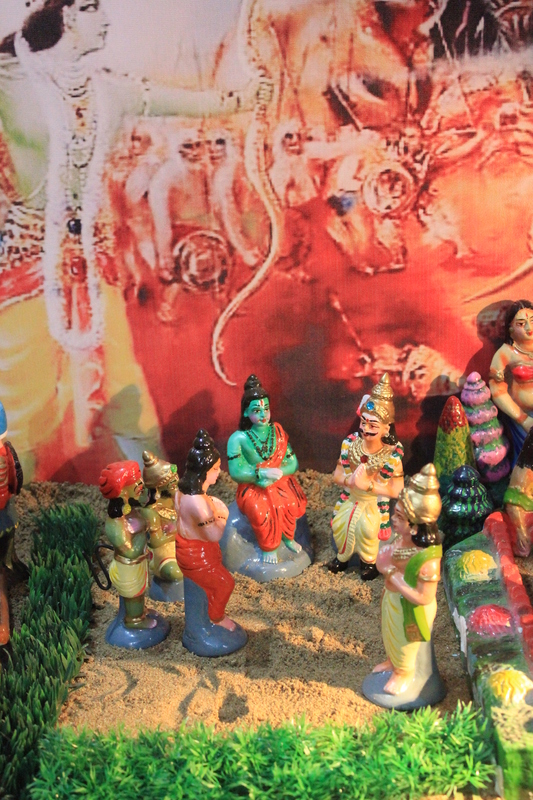 Hanuman grows tall and decides to cross the ocean. 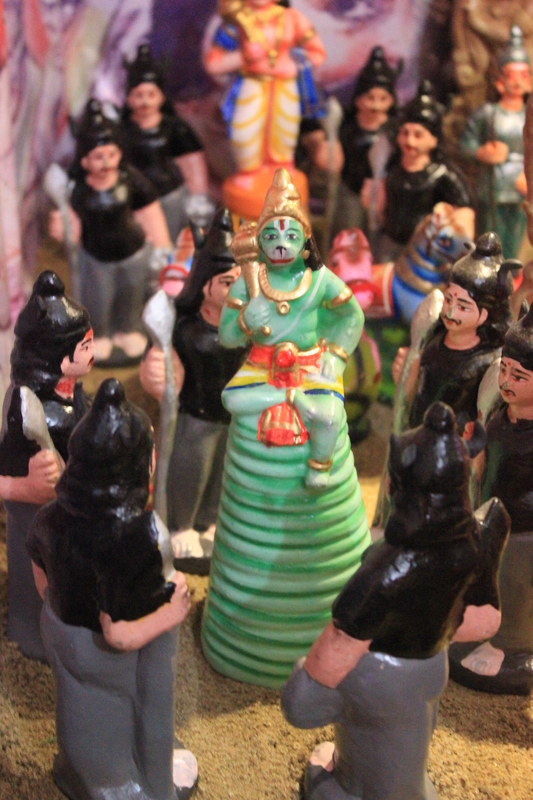 Hanuman meets the demoness Surasa. 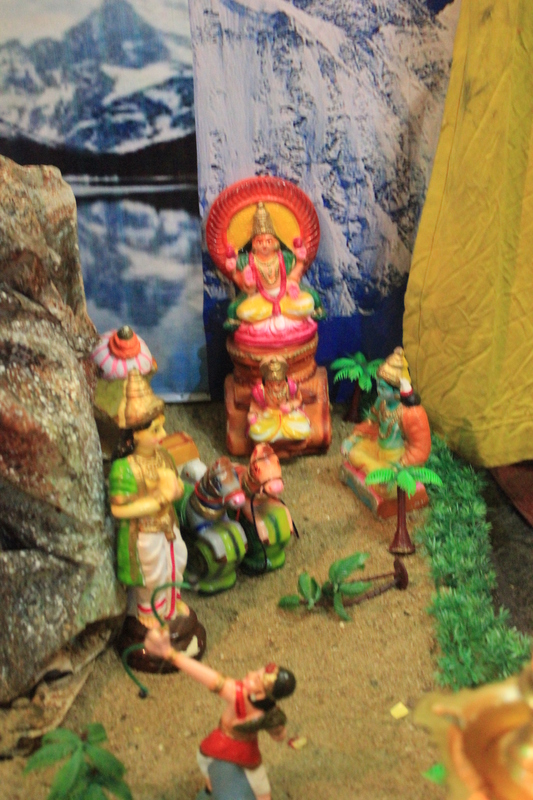 Hanuman meets Sita at Ashokavana and hands her Rama’s ring. 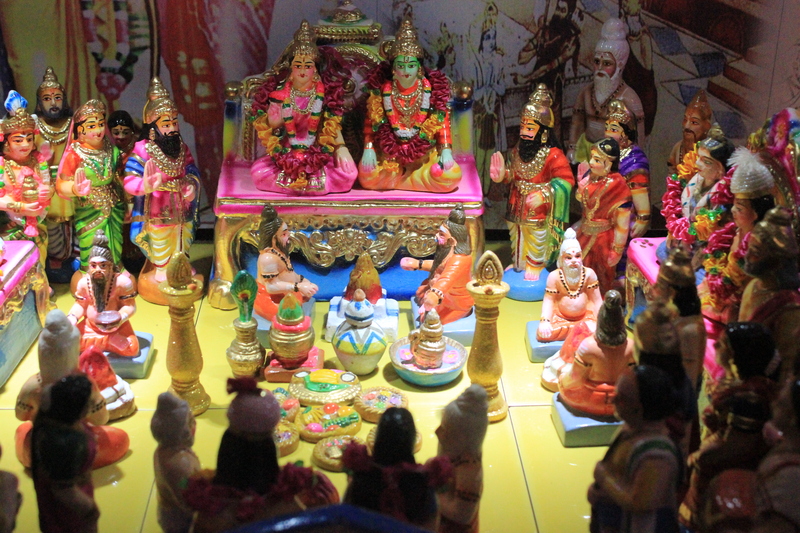 In turn she too gives him a token of love and gratitude to be handed over to Rama. 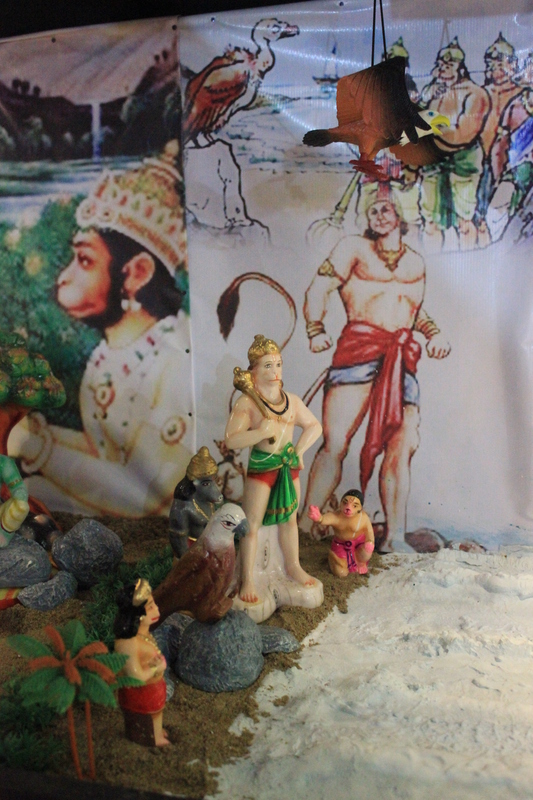 Ravana’s son Indrajit captures Hanuman. 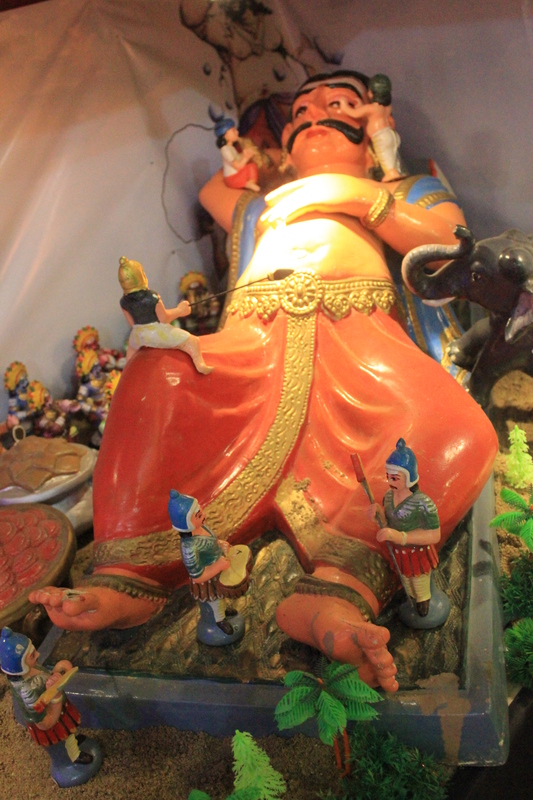 By then Hanuman has managed to kill five of Ravana’s senadipatis (army generals). 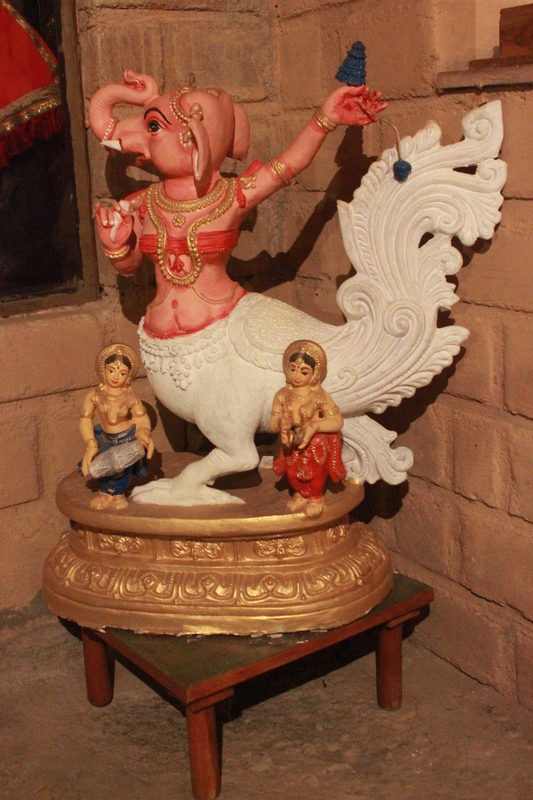 Hanuman sitting on his tail. 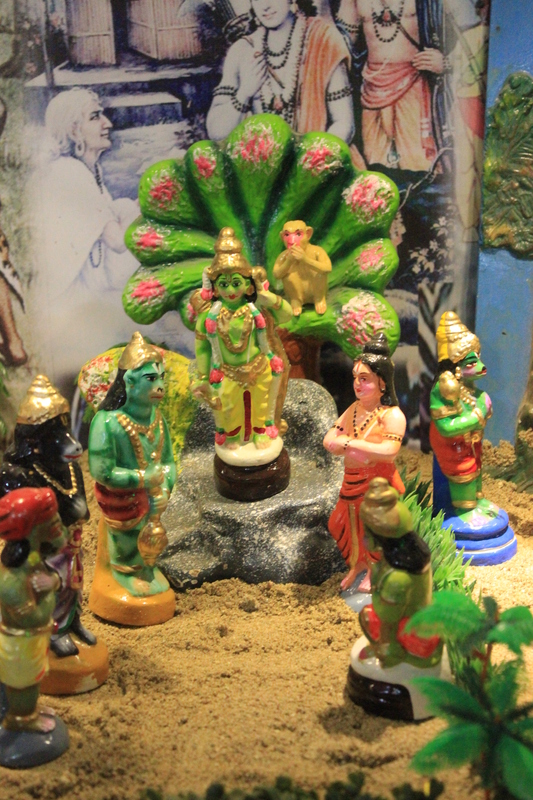 Hanuman is brought to Ravana’s court. 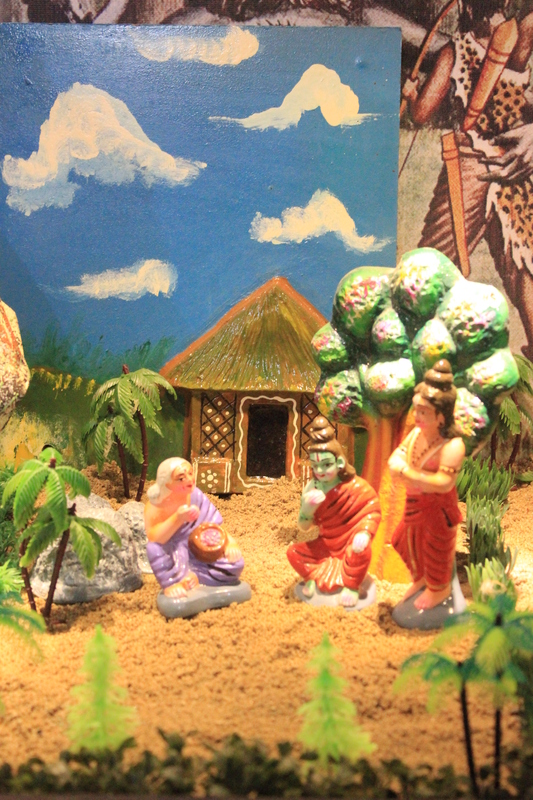 Hanuman meets Rama and conveys Sita’s message to him. 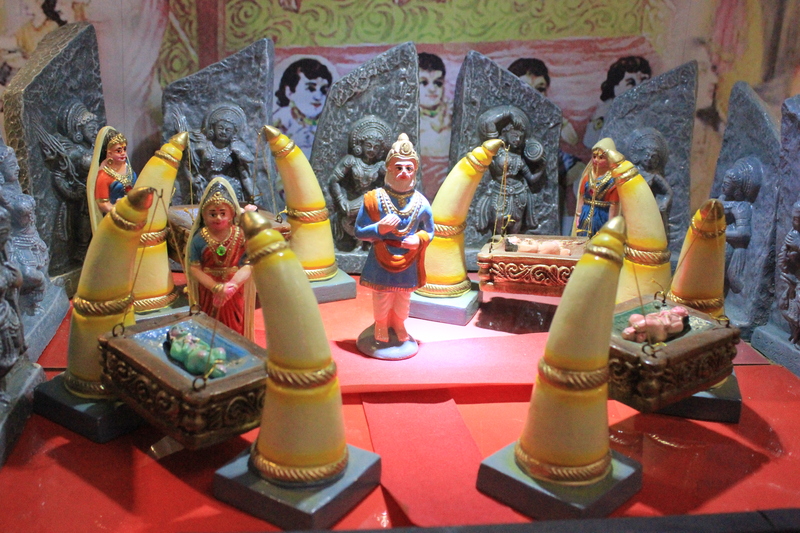 Construction of the bridge by Rama and the vanara sena gets underway. 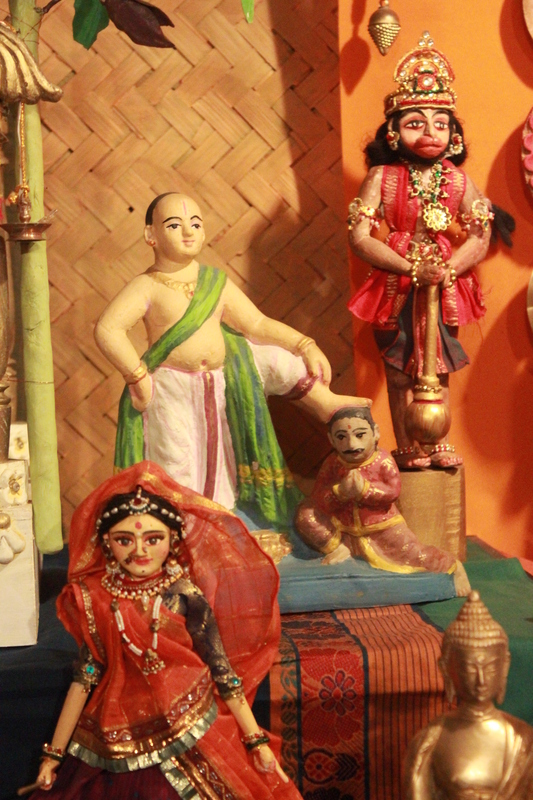 Rama appoints Angada as a messenger to Ravana. 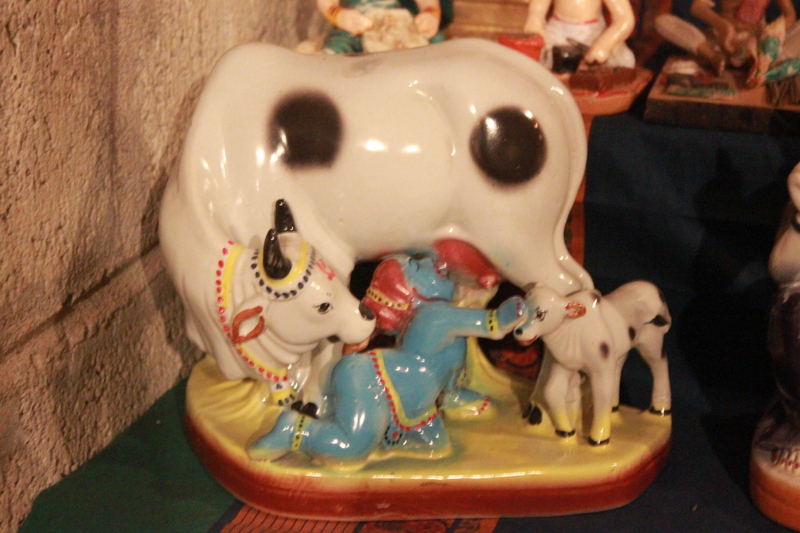 Angada was known to have great diplomatic skills. 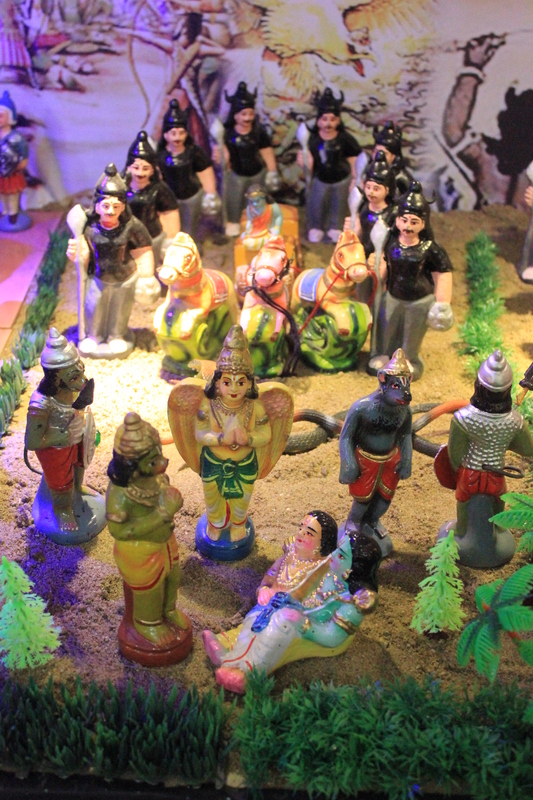 In the fierce battle that ensues between Rama’s vanara sena and Ravana’s army, Indrajit uses the Nagastra to finish off Rama and Lakshmana. 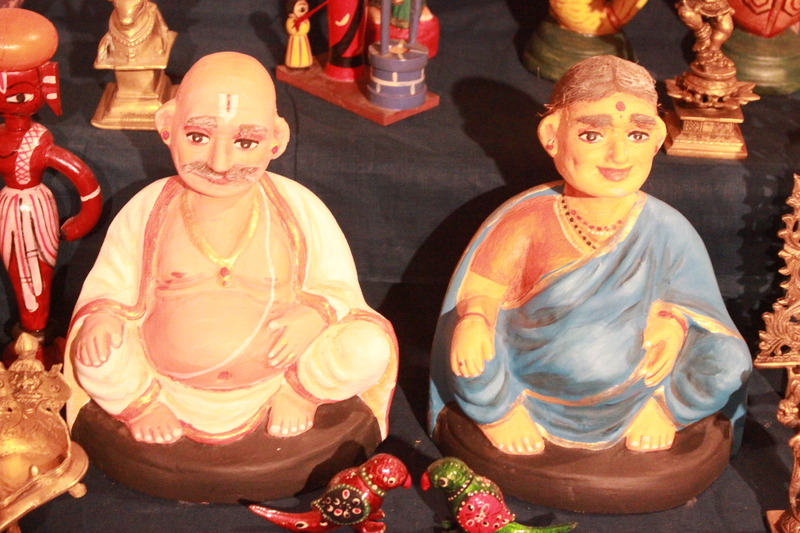 The brothers become unconscious. 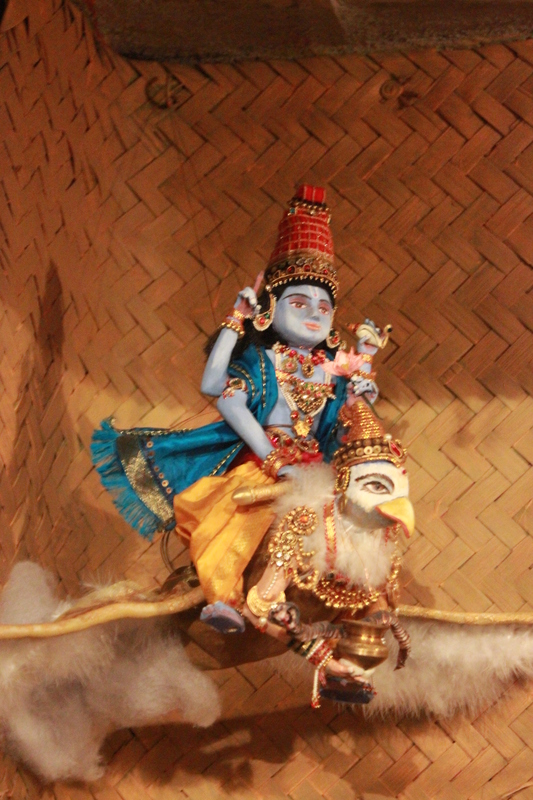 The divine bird Garuda brings them back to consciousness by brushing his wings against them. 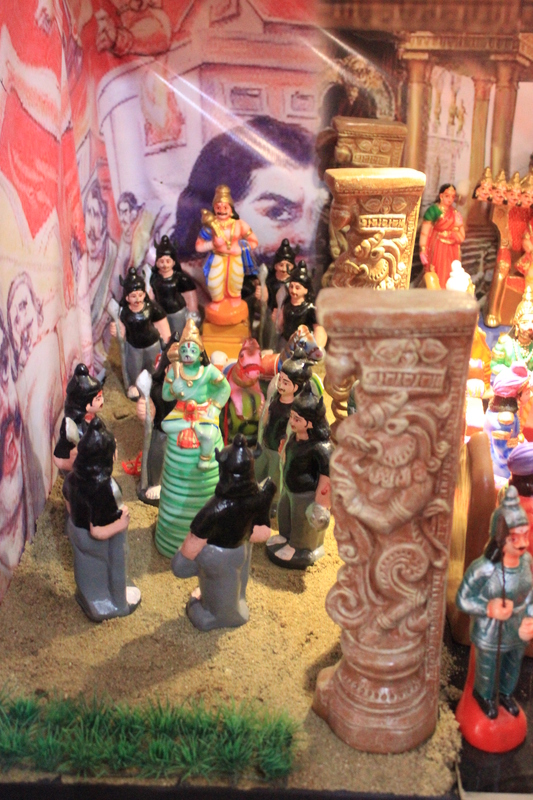 Ravana sent back by Rama from the battlefield. 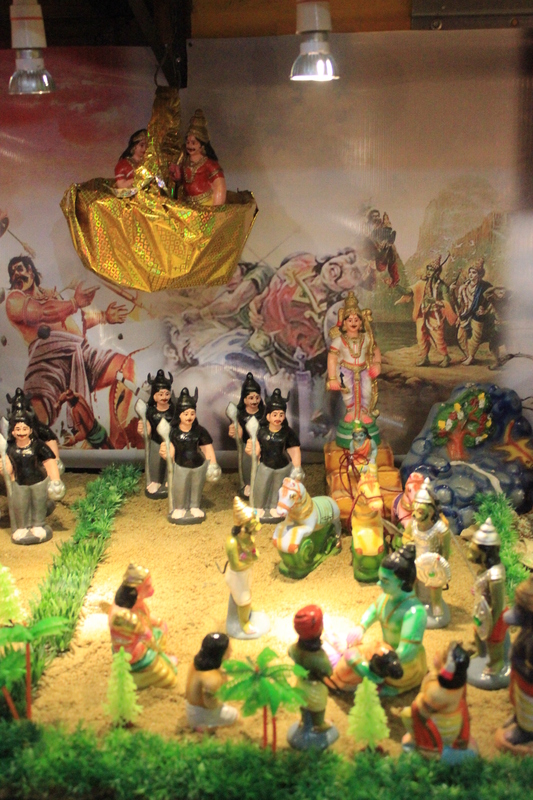 Ravana sends demons to wake up his brother Kumbhakarna from his slumber. 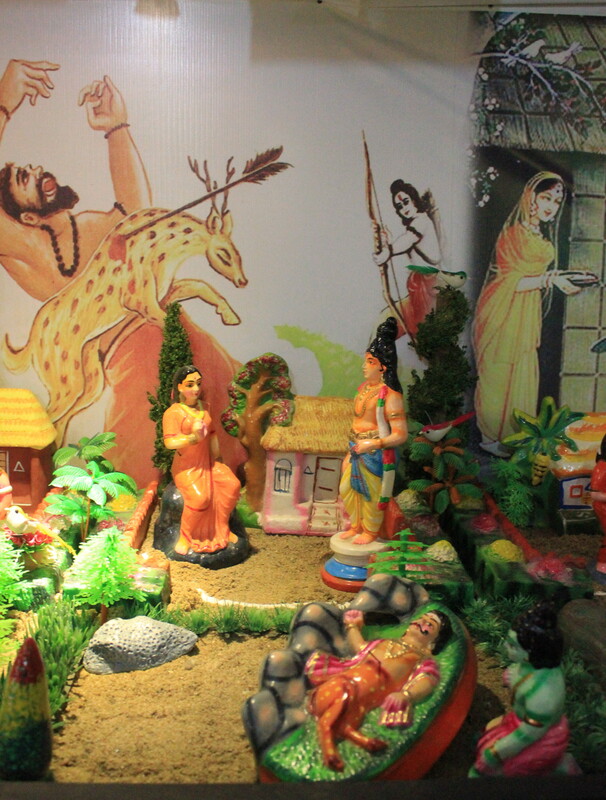 Indrajit kills an illusionary image of Sita and using Brahmastra makes Rama and Lakshmana unconscious. 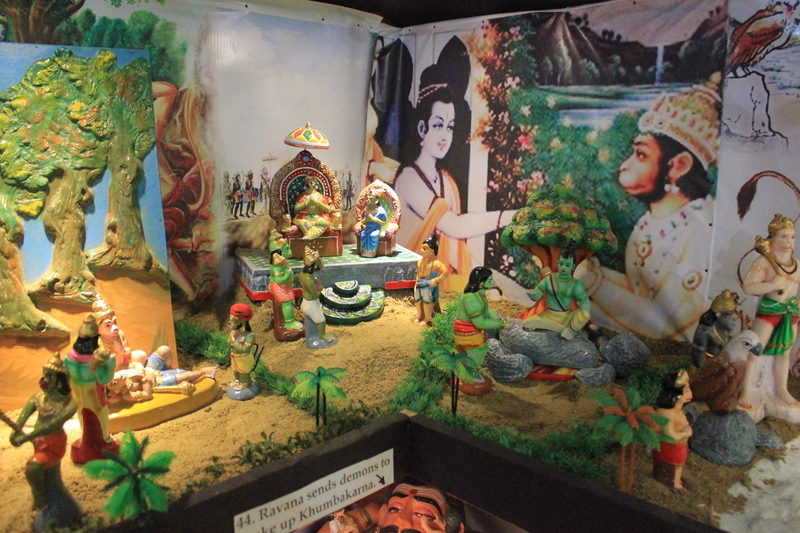 Hanuman bringing the Sanjeevini Parvatha. 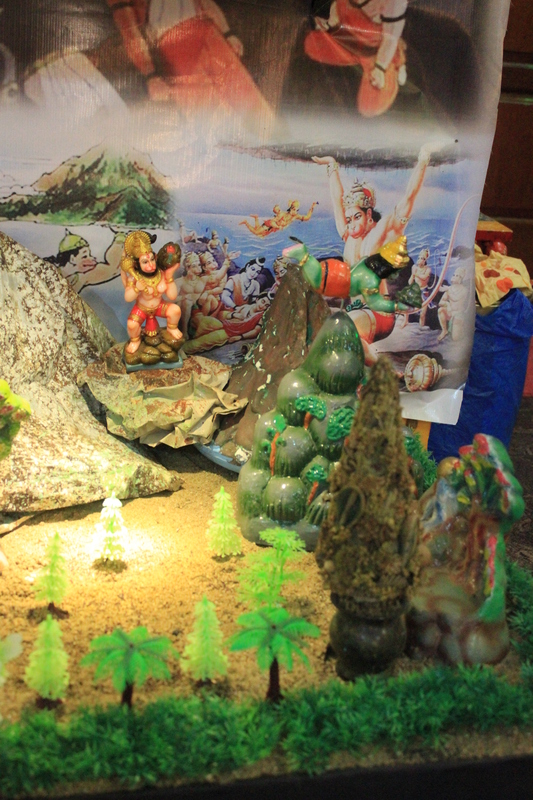 Hanuman arrives with the Sanjeevini Parvatha. 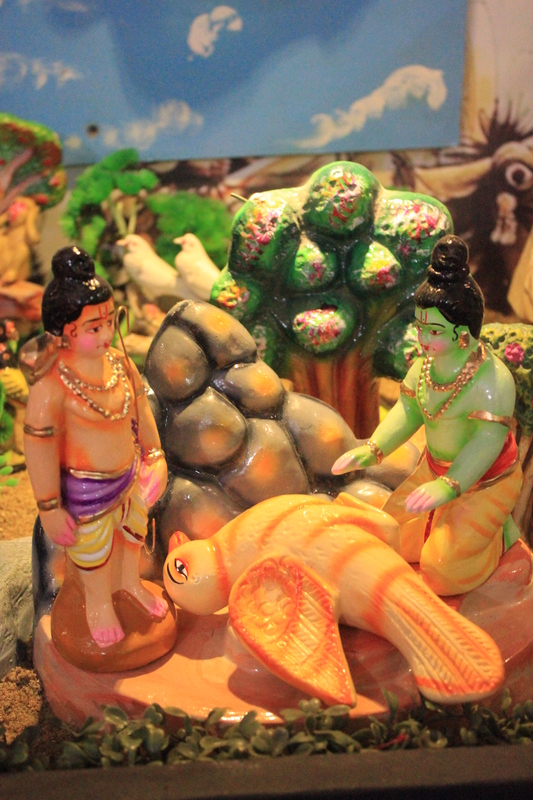 Rama tends to an unconscious Lakshmana. 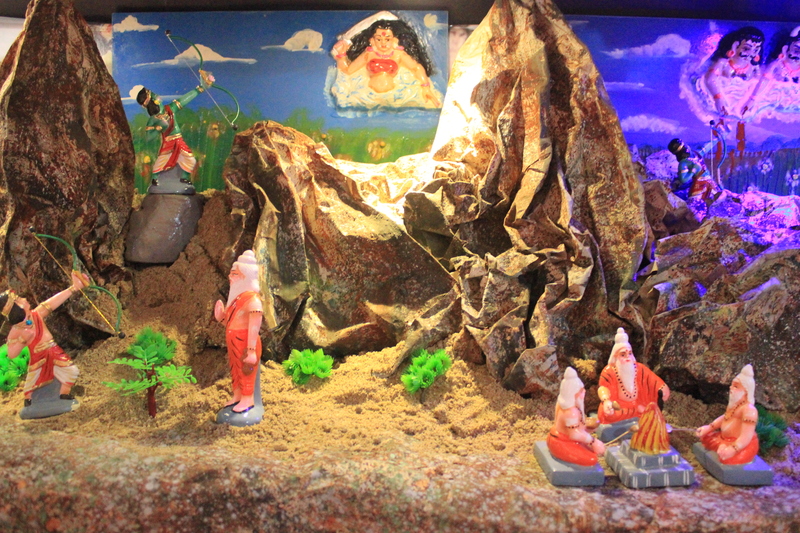 Lakshmana kills Indrajit at the Nikumbala Caves. 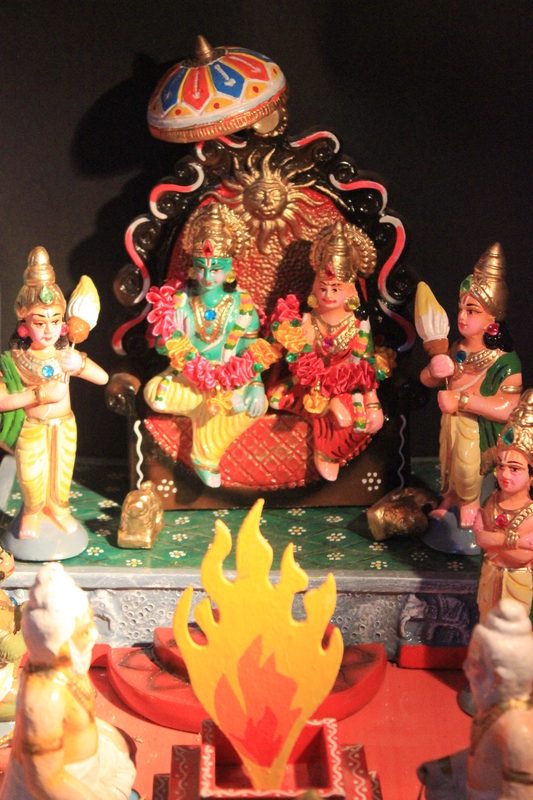 Rama invokes the blessings of Surya by chanting Aditya Hridayam before embarking to kill Ravana. 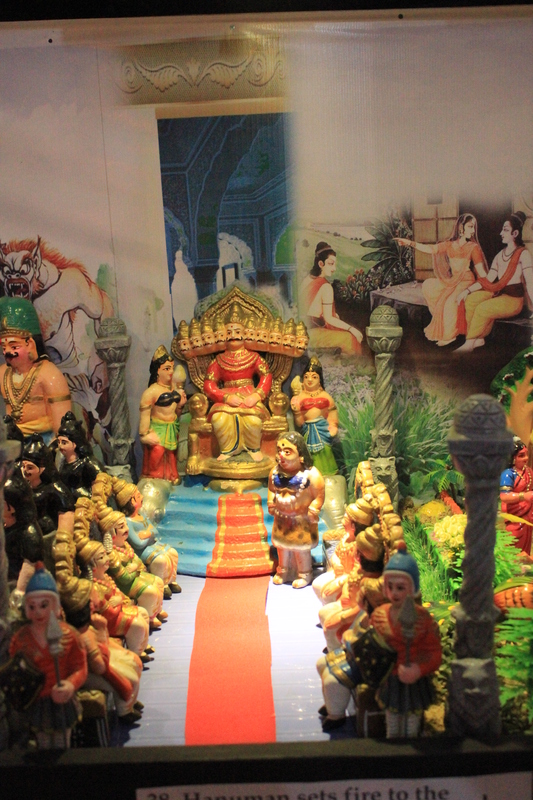 Vibishana is all set to take over as King of Lanka. 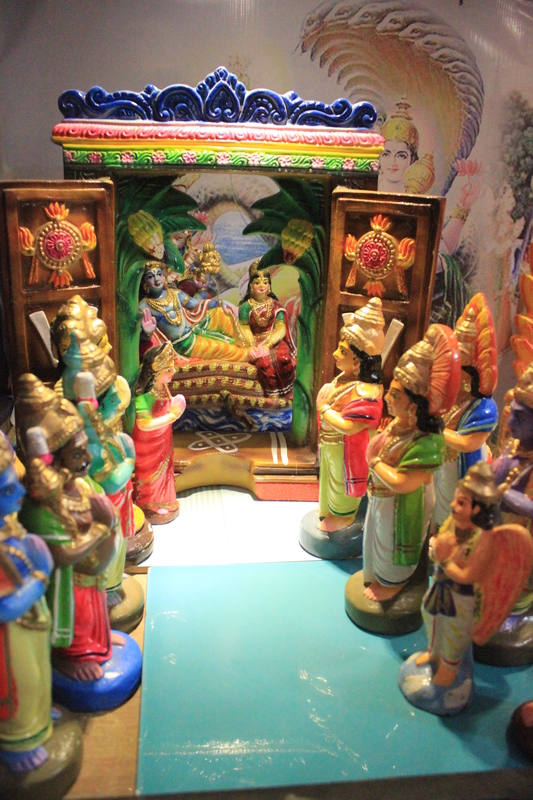 Lakshmana enters Ashokavana to release Sita. 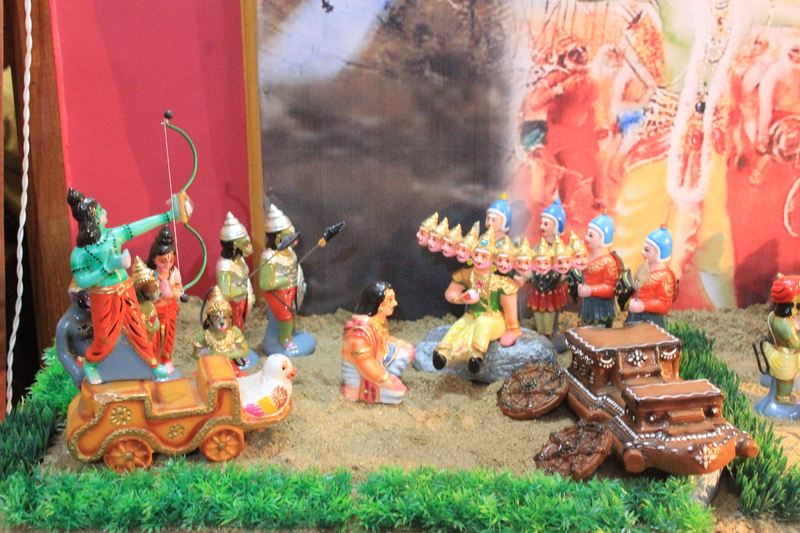 Rama and Sita in Ayodhya. 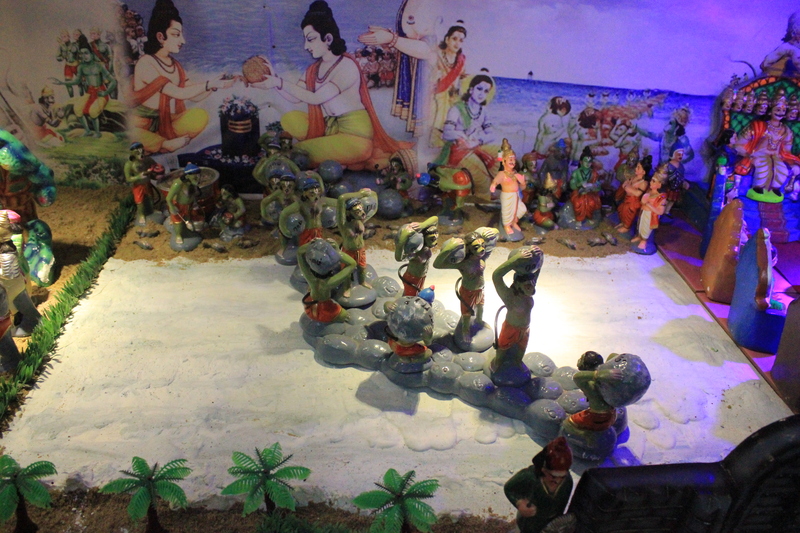 Installing of Shivalinga to remove ‘brahma hathya’ sin in Rameshwaram. 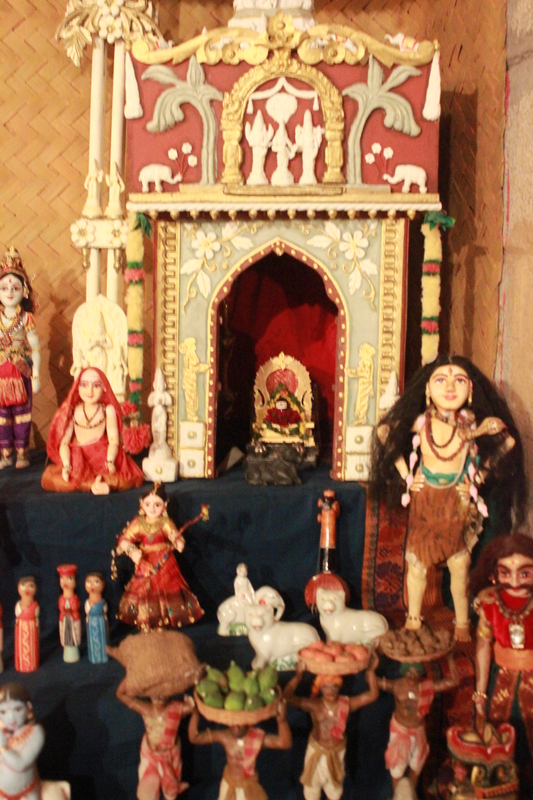 After this spectacular doll feast there was one more to come and this one was mixed with theatre. 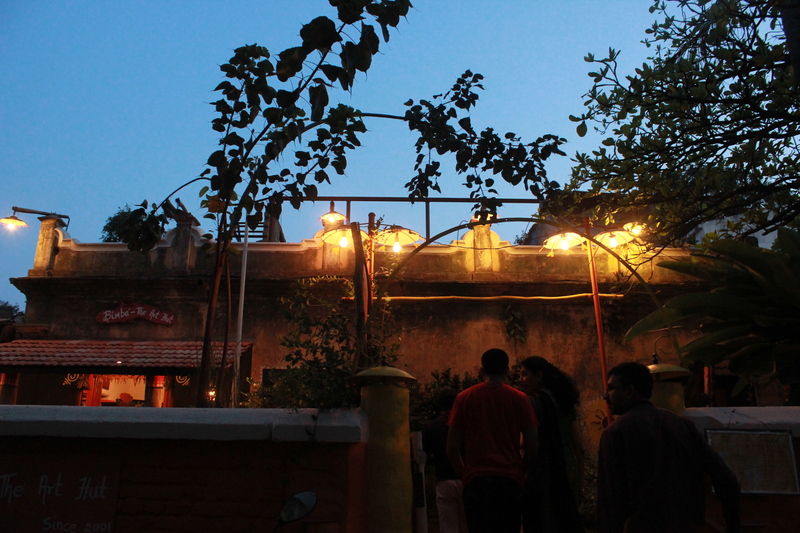 ‘Bimba’ The Art Ashram was soaked in festive fervour and ethnic chic. 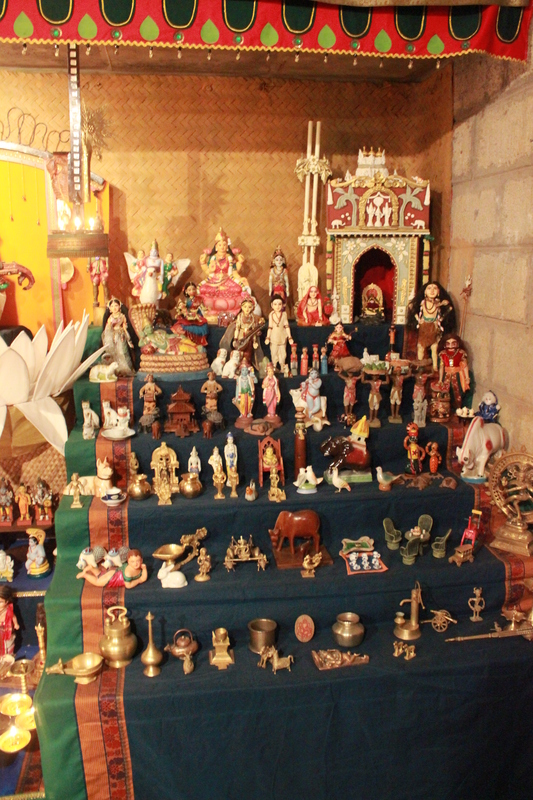 There was a doll arrangement in one of the huts with age-old dolls gleaming in the dim light. 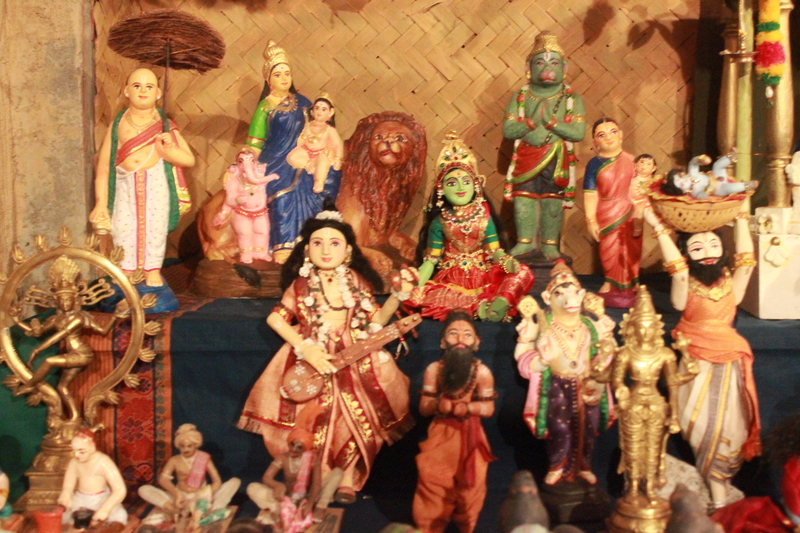 Actually, the muted lighting was accentuating the beauty of the dolls. 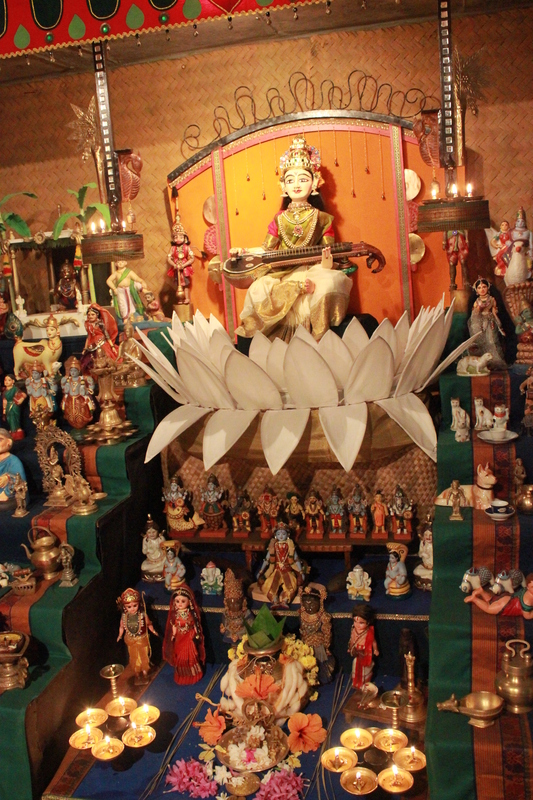 The star attraction here was a large Saraswathi. 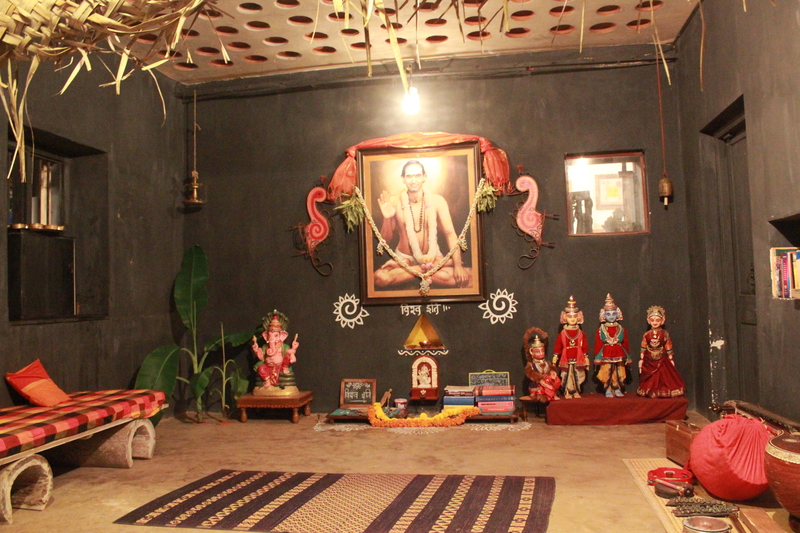 A dream stage for any musician! 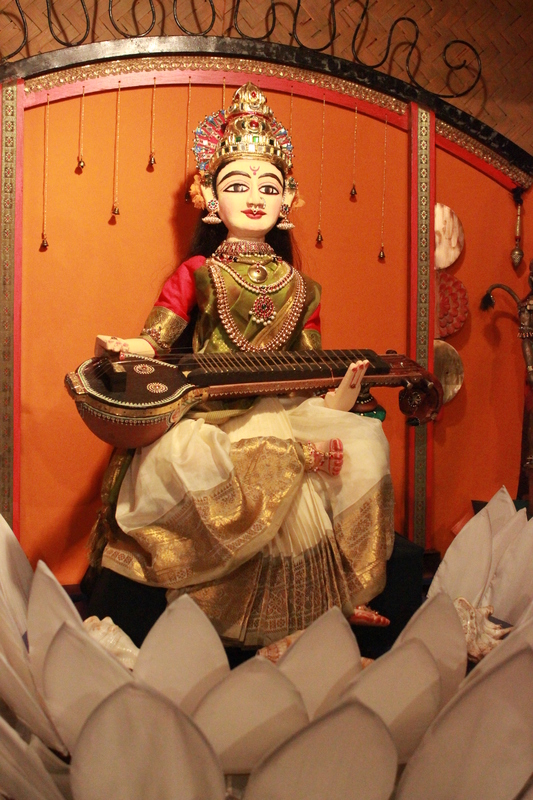 Goddess Saraswathi, the star attraction in the doll arrangement towers over the other dolls. 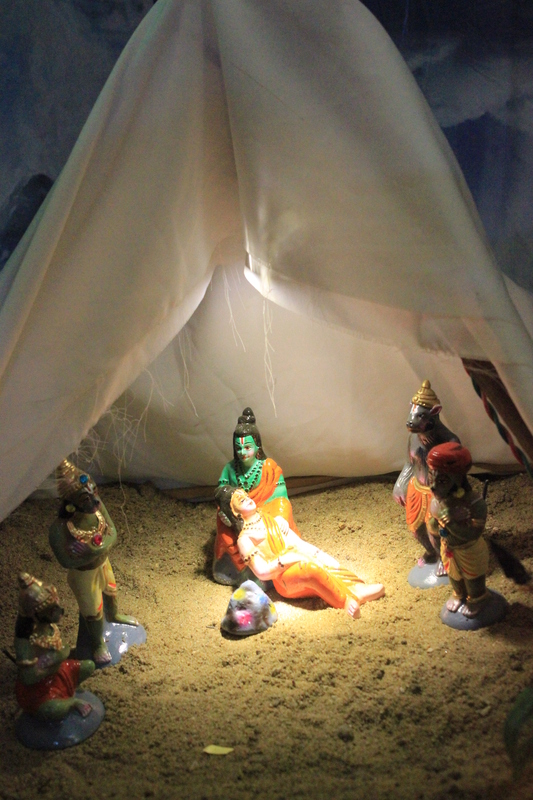 The evening ended with Rasalok, an enchanting still theatre performance where the artist Deepika Dorai had the audience (mostly children) spellbound with the narration of Kanakadasa’s life story titled ‘Ecstacy Enslaved’. 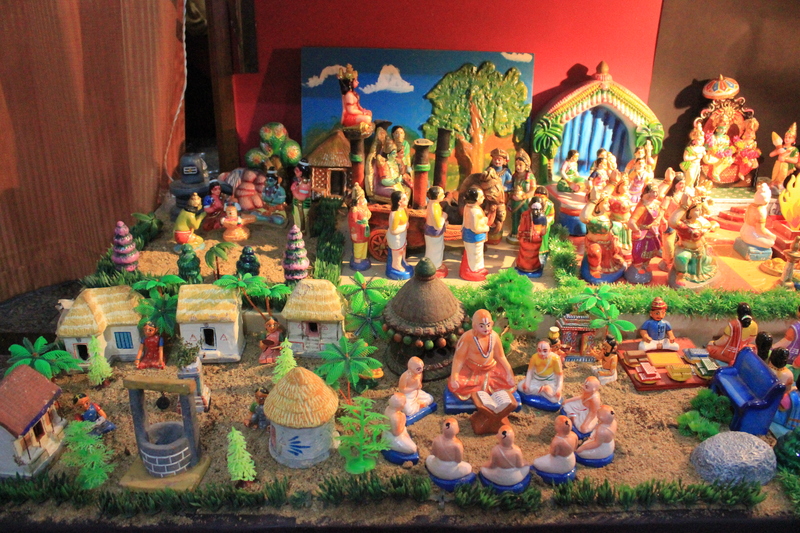 The stage depicting a typical scene from rural Karnataka had dolls as characters representing village folk, domestic animals, Kanakadasa, his guru Vrishabacharya and more. 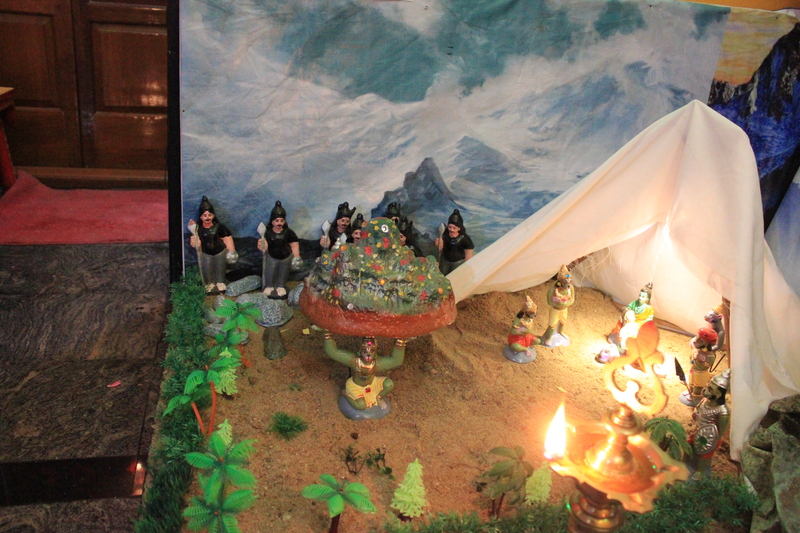 It was dark inside the hut and only the stage was lit. 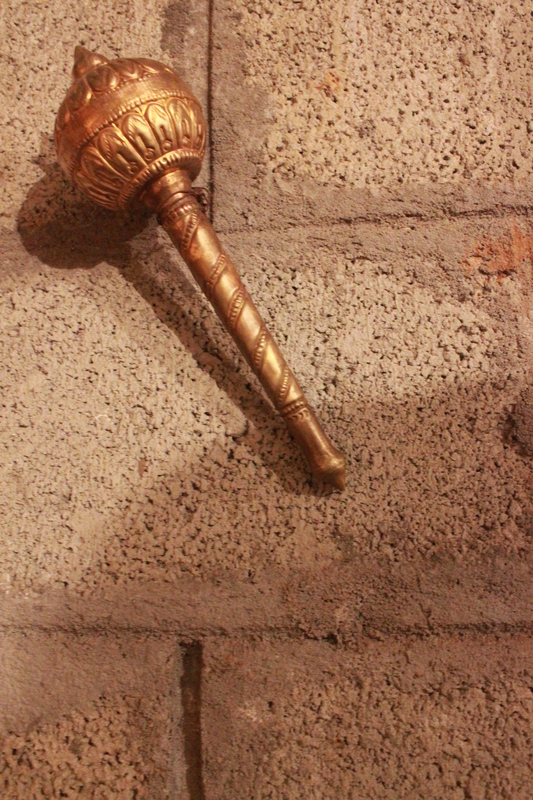 Deepika had a torch with her and flashed it at each character as she introduced them. 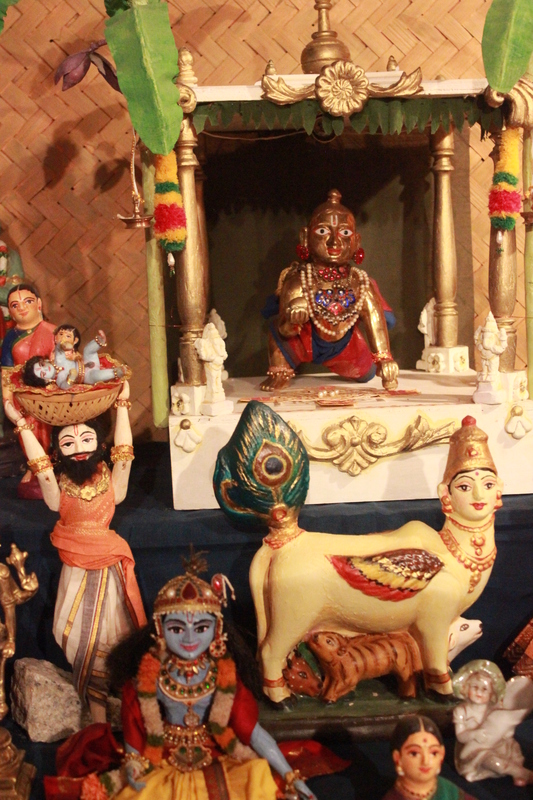 The narration in English was now and then punctuated with Kanakadasa’s bhajans and other sounds. 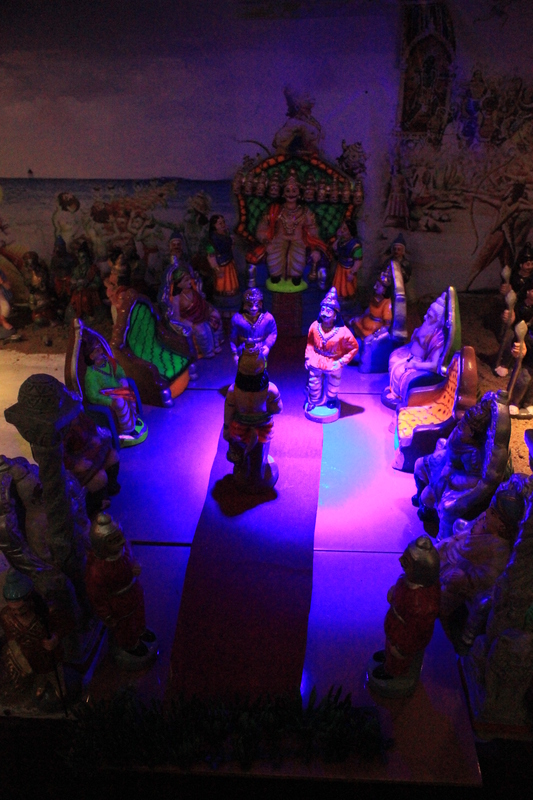 This was the first time I was audience to such a performance and to say that I was dazzled would be an understatement. The 90-min performance was both enchanting and uplifting! I hope to make it to Bimba some day again.